Q: For my first robot, I was thinking of building a finger tech robotics kit and adding a lifter like the add on like Whiplash’s without the spinner powered by a weapon motor. Any good? A: [Mark J.] You appear to have mistaken 'Ask Aaron' for 'Instagram'. Should you submit another question here, please do take a moment to read the explanatory 'thank you for your question' page that appears after your question is submitted. Since you're expecting an immediate response and you're paying nothing, perhaps you'd like to go to the Frequently Asked Questions and read section #8 -- which gives quite specific advice on the design for your first combat robot. Q: For my post, I pick the second. Also, I did not mean to re send the exact same post eight minutes later. I know that makes me sound like an idiot, and.. I kind of am. Is there any major flaws with the lifter idea? Is it too complicated? I don’t want to make a wedge. Q: Hey. Is the Fingertech kit without the weapons good? A: [Mark J.] The FingerTech Viper Combat Robot Kit is a good first build. The components are well selected, the instructions that come with the kit are clear and complete. Damaged components are easy to obtain and replace. Upgrading and customization of the 'bot is relatively easy, and Fingertech offers simple weapon add-ons when you've mastered the basics of robot combat. More detailed comments on the Viper and other robot kits can be found in this archive. 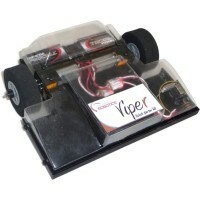 The price of the Viper kit is affordable, but it does not include the required radio transmitter/receiver or a charger for the robot's LiPoly battery. These components are available from FingerTech, but the radio system they offer is poor for the price. My recommendations for R/C radios can be found in this post in the Ask Aaron Radio and Electrical archive. Q: Also, what is an ant weight weapon motor that you recommend that is pretty powerful? A: The properties of a proper weapon motor depend on the type of weapon you're making. My recommendation for an antweight spinner weapon motor would be much different from my recommendation for a specific lifter, axe, or crusher. There are many, many posts in the Ask Aaron Robot Weapons archive about selecting motors for specific weapons. Q: Also, I am not going to do my lifter idea for my first build, but what about my second? A: When you return from your first tournament you'll have a much better idea about whether your skill and experience levels are a practical match for your design ideas. You'll be able to answer this question for yourself. Q: Also, are the 'Nuts and Bots' kits OK for a first build? A: Nuts and Bots is a company in the United Kingdom -- they offer 'Ready Built Robots' to compete in the 150 gram 'UK antweight' class, which is very different from the one-pound (454 gram) 'US antweight' class. Unless you're planning on flying to England to fight robots I'd suggest a one-pound US antweight for your first build. Q: I know the nuts and bots kits could not be run in antweight, but what about fairyweight? A: If that was a good idea I would have mentioned it. UK antweights have different rules and fight in much different arenas than US fairyweights. I very seriously doubt that the 'Nuts and Bots' pre-built 'bots would be competitive as US fairies. It's also easier to find an antweight tournament than a fairy fight. Q: Also, could either the wedge viper or vertical spinner viper work? A: The Viper vertical spinner add-on weapon is completely useless -- avoid at all costs. I'm getting tired of telling you to build the standard wedge for your first robot. Ask me again, I'll tell you the same. Q: I know I am asking a lot of questions, but is the D2 antweight kit, possibly reinforced with Titanium, work for a first build? A: You're asking a lot of questions but you're not paying much attention to detail. The BotKits D2 Combat Robot Kit is a three-pound beetleweight, not an ant. It comes well armored with a huge titanium plow -- no additional armor is required. The D2 kits are quite competitive in their class, but are considerably more expensive than the antweight Viper. Q: For the Viper kit, is there any way I can either reduce stress on the motor or do you know of another similar sized motor? A: Why do you believe that the Viper drive motors need to have their 'stress' reduced? The FingerTech 'Silver Spark' motors that come with the Viper are probably the most popular motors in the class and perform very well. I would suggest that you run the Viper kit with the stock motors. Stop trying to improve a robot you've never driven. Q: Ok. Only a few more questions. I didn’t mean the actual motors, I meant the weapon motors on the over/undercutter. You said it would burn out multiple motors per competition. A: You can ask questions about weapon motors when you're ready to build a 'bot with an active weapon -- which you are not. For the benefit of other readers, the FingerTech spinner weapon add-on kits attach their weapon blades directly to the output shaft of an unmodified brushless outrunner motor. Hobby outrunner motors are designed to spin propellers on small model aircraft, not to survive the enormous strain of impact in robot combat. Extensive modification with custom machined components is required to prepare such motors for direct weapon drive. This process is discussed several places in both the Ask Aaron 'Robot Weapons' and 'Ants, Beetles, and Fairies' archives. Start with this post and this article in 'Servo' magazine. Q: Also, are the heavyweight chasis kits good for my next robot? A: Stop worrying about your second robot before you've built and competed with your first robot. Enter a robot combat competition. If you enjoyed your experience at the tournament, evaluate what you learned there to determine how your skill and experience might best allow you to progress in the sport. If you have more questions about your first robot feel free to ask them. A: [Mark J.] The weapon kits from FingerTech are not designed for quick swap-out and would be difficult to convert. Ideally, interchangeable weapons should be assembled as complete modules that slide into slots or channels in the chassis and are then secured by a minimal number of fasteners. See the modular weapons used by Chaos Corps' Bombshell as an excellent example. Q: Taking your advice about not having an active weapon, I´m considering only using these weapons in non-competition matches. Either way, the weapons will just be regarded as optional extras, and all of my focus will go into robot with the weapons being lower of a priority. I plan to have a variety of configurations to best suit the opponent that I am fighting. I have an anti-spinner configuration with all aluminum armour, and with a wedge similar to the D2 kit wedge/Algos wedge. A: If you're going to upgrade your wedge I'd suggest upgrading the material as well as the design. Even the aircraft grades of aluminum are too 'soft' to fully qualify as 'anti-spinner'. The 'D2' and 'Algos' wedges are made from thick titanium alloy for very good reasons. It's a better purchase than another active weapon. Q: In addition, the lifter servo is giving me problems with its range of motion being too big. The servo tries to push the lifter against the top of the wedge. Could a servo saver be useful in allowing room for error? Mechanical The arm on the servo that drives the lifter is on a splined shaft. Remove the screw holding it in place, wiggle the arm free, and rotate it one spline farther 'up' before replacing. Limited precision, but it may be just what's needed if the problem is all with the 'down' location. Electronic Your R/C Transmitter has a function to adjust the range of servo motion that can be set to precisely position the servo at each end of travel. If you're using the FS-CT6A radio from Fingertech, see Section 14 of the radio manual for instructions on setting the servo 'Endpoint'. Servo travel adjustment instructions for other radios may be listed in their manuals under 'Adjustable Throttle Volume' or 'Travel Adjust'. Adjusting the function settings on the CT6A transmitter is awkward; it requires a special cable to connect the transmitter to a PC running software downloaded from the FingerTech website. More advanced radios have built-in display panels and function menus that make performance adjustments quick and easy without a cable or PC. Next time spend an extra $15 for a better transmitter. For more info on transmitter functions and their use in combat robots see Radio Control Systems for Combat Robots. Q: Xmas Viper Guy (its been a while). So far my antweight viper kit seems to be working well. Before any competitions, I am considering getting an active weapon on my robot. The screws for the top, and front armor have been replaced with slightly longer ones to allow room for rubber spaces to avoid cracking, and splitting the armor. Also as seen in the photo the Viper has custom 1/8"-3/16" aluminum armor that can be interchanged with lexan. While I think my antweight can be an effective wedge, I'm considering getting one of the addon kits. I remember you saying that the vipers don't win events very often so I want to make the antweight competitive, and might even make the addon a modular weapon. My question is, which addon would you reccommend most, based on reliability, and offense? I'm leaning toward getting the vertical spinner to act as a bit of a "nibbler", but not for massive impacts. I have a feeling you will say to go for the lifter or to not bother. Whatever you think will be most competitive is what I will go for. A: [Mark J.] I strongly, STRONGLY, STRONGLY suggest that you enter your first competition without adding an active weapon. You will learn an enormous amount about robot combat at that event and will be better able to make up your own mind about the types of weaponry might be effective against the competitors you will face in future contests. It's best to keep time management at your first event as simple as possible. The period between matches will filled with battery management, repairs, radio adjustments, and impromptu modifications. If you have additional time it will be better spent watching your opponent's matches to look for strengths and weaknesses than tinkering with your weapon. You express an interest in winning, and wedges have a better match win percentage than spinners or other active weapons. The three Viper add-on weapons (you counted both 'uppercutter' and 'vertical spinner') each have strengths and weaknesses. The 'undercutter' is capable of doing effective damage, but it places a great deal of load on an unmodified brushless motor. It's not uncommon for this weapon to require multiple motor replacements at a single tournament. The small vertical spinner is easier on weapon motors, but is more of an annoyance than a serious weapon. The angled 'wedgelet' intended to run an opponent up to the awkwardly positioned impactor is HIGHLY vulnerable to horizontal spinners. The lifter can self-right the 'bot, but the linkage trades speed to get that high lift. Although technically a 4-bar mechanism, the actual lifter movement is a simple pivot. It's convenient to have the kit, but you might do better with your own design. I do have a few suggestions for relatively simple things that may add to your 'bots competitiveness. An 'Algos' style front wedge will get rid of the sharp edges on the sides of your single-plane wedge, making it more resistant to horizontal spinners and to vertical spinners that chance to catch you a bit off-angle. As long as we're stealing design features from 'Algos', I'd suggest counter-sinking the wedge attachment screws. A drum spinner has a good shot at snagging a capscrew head and bouncing you off the ceiling. You might want to have a 3-cell battery in your spares kit. You may decide that you need some extra speed against a nimble opponent or in a large arena. It's a cheap and simple upgrade. Q: Xmas Viper Guy Again. I do have a 3 cell version of the battery which I was afraid to use as I feared it would burn out the electronics. The battery has the same specifics as the standard 2 cell that came with it. I have a charger, and lipo battery charging bag. A: The tinyESC motor controllers are rated for up to 36 volts, the receiver is provided with a constant 5 volts from the Battery Eliminator Circuit (BEC) in the tinyESC, and the Silver Spark gearmotors are run as high as 18.5 volts in competition, although with reduced reliability. You'll be fine at 11.1 volts. If you do add the lifter kit, FingerTech recommends adding a 9 volt regulator to supply the lifter servo when running a 3-cell battery. Either of the spinner add-ons will run directly from 11.1 volts. Q: For the wedge, is the angle to steep? A: That's a matter of personal driving style and preference -- something you'll learn at your first tournament. I have a strong preference for a 'scoop' rather than a flat wedge for insect class 'bots, but try your wedge as-is. You may like it. Q: I'm considering buying the lifter, because I believe that it is better suited for getting under opponents. I'm also intending to make the weapons removable so that I can go into fights with or without the active weapon, depending on the opponent. I might also keep the weapon off of the robot for tournaments, and use it for rumbles, and whiteboard matches shall it pose to be a problem. I hope that this information gives you a better understanding of what I can, and want to do. A: Pit time can be a precious commodity at a tournament. You may or may not have time to swap out weaponry, particularly late in the competition when time between matches grows shorter. If you do have interchangeable weapons, design to make the swap as quick and foolproof as possible. 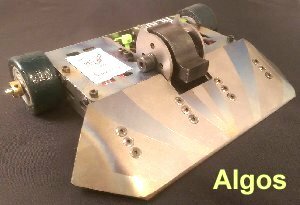 Q: Also, can the bent wedge sections on 'Algos' be replaced by a long wedge like 'Whoops' from Robogames? I'm worried that bending the sections will cause the wedge to lift. A: No. It isn't mandatory, but those 'drop-end' wedges are very common for very good reasons. High-speed spinner weapons have trouble getting 'bite' on smooth/flat surfaces, but they can very easily grab onto a sharp exposed edge -- like the outer edges of a wedge. A smooth bend turning those ends down to the arena surface keeps them from being 'spinner bait'. Lengthening the wedge just hangs those edges out in an even more exposed position. Short on shop tools? Bend the ends down, rough trim with a hacksaw, smooth with a file, and hone to level with a sheet of sandpaper on a flat surface. Comment Hey, just a heads-up to the Xmas Viper question. The Viper "undercutter" is no longer recommended as an undercutter, and instead is marketed as a Hazard-style "overcutter" using the wedge to push bots into the path of the top blade. You can still use it as an undercutter but it's extremely difficult to drive. A: [Mark J.] People like to put things in neat and tidy categories, even when it doesn't matter. I'll answer your question as soon as you tell me whether a photon is a particle or a wave and whether a frog is a lizard or a fish. A: [Mark J.] As pointed out in Frequently Asked Questions #8, it's overlooked basics that cause the most trouble for new builders. Sweat the details. Invest in a small tube of blue Loctite threadlocker and use it on all your threaded connections -- but keep it away from the Lexan plastic parts: it reacts with the plastic to make it brittle. Place a small drop of oil on the output bushing of each motor, then run each of them at about 1/3rd power for 5 minutes in each direction with wheels off to properly seat the motor brushes. Get to know your radio. The T6A radio available with the kit is a very basic transmitter with limited adjustments, but do obtain the optional programming cable that allows you to connect it to a computer for adjustment. Builders underestimate the impact on the robot that proper adjustment of the transmitter functions can have on performance. Spend a lot of time driving the 'bot and experimenting with the transmitter settings -- particularly the 'Dual Rate' settings for turning speed. Don't be in a hurry to 'upgrade' to an active weapon. Statistically, wedges have a greater win percentage than spinners. In particular, Viper owners report that the horizontal spinner add-on design places too much load on the motor shaft and results in frequent motor failure -- you may destroy several weapon motors per competition. If you're itching to replace something, the weakest component of the kit is probably the plastic front wedge. I would replace it with a design similar to the 'Algos' wedge (pictured) in 1/16th inch grade 5 titanium. Addendum Almost forgot: the foam rubber tires are great at absorbing impact, but traction is only fair. You can improve traction by coating the tires with 'RTV Silicone Adhesive Sealant' (that's what makes 'Algos' tires shiny) or 'liquid latex'. Apply a very thin, even layer and allow to cure (about a day). Q: (Xmas Viper Guy) I'd like to mention that I plan to use the FS-T6B Controller/Receiver. A: Builders seriously underestimate the importance of a fully configurable R/C transmitter. You should spend more than $40 on your R/C system. For another $15 you can buy a much more capable system that does not require a laptop to program and which will deliver much greater control capacity. See Combat Robot Radio Systems - what functions do you actually need? Q: For the wedge part, I have alloyed aluminum and steel plates(each 1-2 mm) as options for the wedge. Would the steel cause weight issues or is it better to use? A: The 'Viper' weighs less than twelve ounces as it comes, leaving more than four ounces for 'improvements'. There are a great many alloys of both aluminum and steel -- some much better than others. Of the commonly available aluminum alloys: 7075 and 2024-T3 make pretty good wedges, while 6061-T6 is only so-so. Hardened steel alloys like AR400/500 are very popular, but more readily available 4130 'Chromoly' steel is cheap and can be heat-treated to be both hard and tough. 'Mild' steel is not worth your trouble. For antweights you should consider obtaining a small piece of grade 5 titanium for light weight combined with excellent resilience and toughness. Q: Also, what would be a good way of making the wheels less prone to being cut off. Against spinners, I think that the wheels would simply get cut through like a knife through butter. Also this is my first antweight so I'm not expecting the best results from it in competition should the chance for me to compete ever arise. I am also considering an interchangeable scoop to face drum robots. Every bit of advice that I can get helps. A: Foam tires are considered expendable. They are good at absorbing blunt impact and will save your gearbox from damage. Pack several spare sets and replace as needed. If you want to add some wheel armor you can add a thin, flexible strip of cut-resistant UHMW polyethylene in the fashion of 'Saifu' for protection, Most builders just keep their strong front wedge pointed at the spinner and hit them until they break. Covering your drive wheels makes you more vulnerable to being 'stuck' in an odd position against the arena wall or standing on your tail. This happens more often than you would suspect. A: [Mark J.] Those impactors are hex drive flat head screws that thread into the weapon. If the 'long' screw won't tighten down to match the other, remove it and correct whatever is keeping it from seating properly. It may not make a difference, but it's sloppy to leave it uncorrected. A: [Mark J.] When a manufacturer drives away potential sales by warning that their product is 'not for beginners' you should believe them. The Kitbots 'Weta 2' is not a simple 'bolt-together' kit. Assembly requires additional parts, fitting and adjustment of the supplied pieces, and mechanical experience to fill in the instruction gaps. It also requires access to a safe enclosure for testing. The FingerTech Viper antweight kit is a better choice for beginners. It is a simple design: easy to assemble, and well suited to modify with add-on weapon kits or with your own concepts as your skill level increases. If you would prefer to stay in the 3-pound beetleweight class, the BotKits D2 combat kit (pictured at right) is beautifully made and has proven itself VERY competitive in national competition. The kits go together quickly, requiring only simple hand tools. A: [Mark J.] The FingerTech beater bar is only the rotating part of a spinner weapon system. It has no mounting brackets to attach it to a chassis and it requires the FingerTech Beater Bar Electronics kit or equivalent to provide a motor, controller, and belt to get it to spin. With enough work and fabrication (not a beginner project) it could be mounted to a FingerTech Viper, but the result would be too heavy to be an antweight and too fragile to be a good beetle IMHO. A: [Mark J.] I believe the drop forks on the bots you mention are prototype parts from BotKits. BotKits will very soon offer a production version 'Wolverine' steel fork kit for the D2. The tool steel forks are off for heat treatment right now. Stay tuned for updates. UPDATE July 28, 2017 -- The D2 Wolverine steel fork kit is now available. P.S The pan robot is nearly complete and it will be ready to fight in the next 'Robot Battles' event in Atlanta in May! A: [Mark J.] The Hexbug 'Fire Ant' uses an infrared remote control similar to a television remote. Line-of-sight control systems like this are difficult to use in a combat arena and are allowed only at the discretion of the event organizer. It's neither fun nor overall enjoyable to have control problems with your 'bot in a match. It's also very little fun to charge into a custom 150 gram spinner robot with a $15 passive plastic toy. You couldn't hope to put up a good fight, and if I were the event organizer I wouldn't let it in the arena. Best luck at Robot Battles! Q: Hello Mark, I am pleased to tell you that my first robot is finally about 85% complete. The only thing that I need now is to attach a pan to my BattleBots Son of Whyachi toy. I already have the pan, it fits over the toy quite well and the toy can push it around. So, here is my question: How do I properly attach the pan to the toy chassis? Thank you for all of your help on this, and previous questions. Sincerely, Luke, from Alabama. A: [Mark J.] Last I remember you had hacked the BattleBots toy chassis as described in the Robot Dojo BattleBots Toy Hack Guide, so it should be looking like the photo at right. We talked earlier about adding a wedge, but this is the first time you've mentioned a pan. I assume we're talking about a cooking pan? I'm generally not impressed by the offensive capability of kitchenware. How exactly do you plan on attacking your opponent with a pan? You'll need to add wide spacer blocks of appropriate height to span the distance from the chassis up to the pan -- a tall block to the front and a shorter block to the rear. Pick locations where you can drill thru the pan, the block, and the chassis to run long bolts. Nuts on the bottom will sandwich the structure together. Additional bracing blocks from the front and back of the chassis attaching to the inside edges of the pan would be desirable. The blocks should be some fairly light but sturdy material. Wood might do, but a resilient plastic like UHMW Polyethylene (used for kitchen cutting boards) would be preferable. A: [Mark J.] The D2 Beetleweight Robot Kit is designed to run with one wedge, and I'm not sure why you'd want to add a second wedge in the rear. I've seen a lot of fight videos of D2s and in the fights they lost I don't think a rear wedge would have helped. The base kit plus battery, receiver, and ESC weighs in at about 42 ounces, leaving six ounces to add your own modifications. Adding a rear-mounted D2 aluminum wedge plus mount and brackets comes to about 8 ounces and will put you overweight without adding much functionality to the robot. You can shave 1.2 ounces by replacing the aluminum bottom panel of the robot with one of the polycarbonate top panels - plus you save the weight of four mounting screws. Replacing the 1.5" wide wheel/tires with the lighter 1" wide wheel/tires from the Ant1 kit will save you another 0.8 ounce. Replacing the recommended Scorpion Mini ESC with a pair of FingerTech tinyESCs will save a little better than 0.5 ounce. Trimming off the bent-down ends of the added aluminum wedge will save at least another ounce. I don't think that a rear wedge is worth all this effort and weakening of the robot structure. I'd consider some other type of modification, or just run the very effective D2 as it comes. Q: Hello Mark, it's the Deadblow to beetleweight guy (yet again) with another question. I have come to the conclusion that having an ineffective active weapon for my first robot is probably a bad idea. However, using the toy chassis I have come up with a "new" idea and need answers to help with some reoccurring problems. For this design, I would like to build an invertible wedge similar to what 'Tornado' used in their fight against 'Gravity'. What components and equipment would I need to build a wedge like that to attach to the front of my 'Deadblow' chassis? A: [Mark J.] Maybe I'm just in a bad mood today, but I'm liking this conversion of a 'Deadblow' push-toy onto a combat robot less and less. Now the cool hammer has turned into a wedge. The use of this chassis no longer makes sense. The plastic and 'butter steel' toy is restricting your choices for motors, wheel size, and weapon mounting. You'll be much better off to put the toy back on the shelf and bolt some motors down onto a sheet of Lexan, garolite, or even thin plywood. Bolt another sheet on top to sandwich your components and find a bent chunk of sturdy metal to attach to the front for a wedge. That removes the dimensional restrictions of the toy chassis and gives you a chance to build something that might survive it's first fight. Motors: the Silver Sparks were marginal for a beetle but they were about all that would fit in the chassis. Real beetle motors are kind of a problem to buy at the moment. Most builders are using motors they find on eBay by searching for "1000 RPM motor". Individual suppliers come and go -- some of the motors are good and some are awful. You want something that resembles the picture at right: output shaft in the center of the gearbox, preferably 6 volt, price around $10. Most builders run the 6 volt motors at 11.1 volts for increased power and speed. I still think the Deadblow toy would make a fun little antweight, but you're trying to make too much out of it. A: [Mark J.] This entire archive is devoted to questions we've answered about Toy Hacks and Kits. Many of the toy hacks talked about there are no longer available from retail sources, but you might find them on eBay. The current crop of R/C toys don't really have much promise for antweight hacks. The next post down this page is an extended discussion with a builder hacking a Tonka Trickster toy that is still available from some sources. Aaron had recommended this toy to a builder who wanted to hack a toy just for some backyard 'bot action, but the builder in the recent discussion is modifying the toy for actual tournament use with a full electronics replacement. Q: So I've been looking at the 'Tonka Tricksters' Aaron recommended in the archives however several of the reviews seem to complain about the range of the toy. They claim the signal drops at around 5 feet from them. A: [Mark J.] Lexan is just as transparent to near IR as it is to visible light. You'll be fine. A: [Mark J.] Control range on these toys seems to vary from one to the next - I've seen examples of these toys with very good range. Get that receiver exposed -- you want line-of-sight between it and the transmitter. I'd also pull the transmitter apart to make sure the IR emitter is correctly mounted. Here's a tip: human eyes can't see the IR signal, but digital cameras can! Point a cell phone camera at the transmitter and you can see if the IR light signal is strong and pointed in the direction you assume it is. If you can't get the range you need, you can replace the control electronics with hobby grade radio gear. You'll need a pair of motor controllers as well -- the simple H-bridge toy controller's won't interface to the radio receiver output. Very simple and inexpensive motor controllers like the VEX 29 would be great. You'd gain improved speed control sensitivity along with improved range and reliability. Q: Exposing the transmitter gave me improved line of sight range, but that's about it: line of sight. Even having the bot facing away from the controller is causing some problems. A: The technology is the same as your TV remote -- the receiver has to be able to 'see' the signal, or at least see a surface illuminated by the light. I'm not sure where the IR receiver is on the chassis but I'd consider moving it to a prominent location on top of the toy/bot. Q: Okay, assuming I plan to modify the car to an FM radio, is there any specific receiver and transmitter you could recommend? I have a quite a few hobby grade R/C cars; could I use their receiver and transmitter instead? A: I'm assuming that your R/C car transmitters are 'pistol-style' rather than 'twin-stick'. That adds a little complexity because your 'bot requires a separate channel to control each of the two drive motors. Your 'trigger' throttle could control one motor and your 'wheel' could control the other, but coordinating the two to drive the 'bot would be a nightmare. There is a solution: you can purchase a 'V-Tail Mixer' that will sort out the inputs from the two transmitter channels and send the correct information to each motor controller -- with this interface you can drive the 'bot just like an R/C car. If you're used to a pistol-style transmitter this is a good option. Your local hobby shop likely has these in stock. Q: So if I have the diagram from your FAQ correct, it's drive motor to motor controller, motor controller to v tail mixer, mixer to esc, then esc to receiver? Anything I'm missing before I actually purchase the parts? VEX outputs to the motors. The VEX 29 ESCs are unusual in that they pull their power thru the receiver rather than directly from the battery. That makes the wiring diagram a bit unusual. Once you get everything hooked up you may find that some adjustments are needed to get the control response correct. The Run Amok Transmitter Programming Guide has a section on sorting out mixing problems that will step you thru the process to get everything right. Q: Okay, final question (Hopefully): The battery charges via a connector soldered onto the main logic board. Once all the new radio equipment is in place, how do I charge the battery? You can save the original transmitter and 'logic board' and clip the original battery leads back onto the battery in the robot to charge. Awkward, but it will work. You mention that you have some hobby-grade R/C cars. Perhaps you have a charger that would be suitable to recharge what I assume is a very small 6 volt NiCad? You can remove the existing battery pack and substitute AAA cells, allowing you to replace rather than recharge. Four AAA alkaline cells would last a full tournament and then some. Q: Hi Mark, Tonka guy back again. I have a quick question about my motor controllers. Your diagram shows the PWM connector going into the receiver, yet the motor controller is a male connector. How do I connect my speed control to the receiver when they are both male connectors? I could cut off a female PWM connector from a spare servo and solder it on, but I don't want to waste a servo and I don't have a second spare for the other speed controller. Do you know of any place that sells just the female PWM connector? A: [Mark J.] Well, that is inconvenient! A three-pack of female servo plugs you can splice on after cutting the male plugs off the VEX 29s. I'd check with my local R/C hobby shop before sending off an order -- they likely have similar items. A: [Mark J.] The Totally Extreme Skateboard -- no longer available. A: [Mark J.] The BattleBots R/C toys had several wheel styles, but they were all custom made for the toys and were never available as spares. The white plastic wheel hubs are a non-standard size, but if you remove the screw in the end of the hub and pull it off you reveal a 6mm diameter white plastic sleeve with a 3mm steel shaft inside. That sleeve is supported by a plastic bushing in the gearbox cover. We can work with that! The cheap and easy solution is to slide a BaneBots 6mm aluminum hub over the sleeve and tighten down its set crew (1/16" hex key required). Then slip a BaneBots 2-3/8" wheel or 2-7/8" wheel onto the hub and install the retaining clip (a little tricky). For a little more money you can install a pair of 6mm Dave's Hubs over the output sleeves and fit Lite Flite tires to them. They require a hex key for the set screw as well. Lite Flite tires are popular with exposed wheel designs like yours because they are very 'spongy' and will absorb great impact. This would be my choice. Robot Dojo used Tamiya 70145 narrow tires on some of their toy hacks (picture at right), but installation requires cutting away most of that while plastic sleeve but leaving enough to ride in the support bushing. The Tamiya wheels are just a press-fit onto a 3mm shaft -- not very secure. I'd use one of the other options. A: [Mark J.] There is no weapon motor in the 'custom series' BattleBots toys, Luke. The weapon is powered from the drive motors via a gearbox. The weapon only spins when the robot is moving and therefore does not even qualify as an 'active weapon'. The gearbox itself is a simple snap-fit into the chassis and is removed at a very early stage in the Robot Dojo BattleBots Toy Hack Guide. You can leave the gearbox in place if you like -- it doesn't violate any rules. Bot Blast allows use of toy radio systems for robots with no active weapons, so your wedgebot should be fine. Now pull the weapon gearbox straight out of the main chassis module. Its a snug snap fit. If you try and run your bot at this point, it won't work, as there is an interlock that keeps it from going unless this is in place. We'll bypass that in a bit. I'm guessing that you removed the weapon gearbox but didn't follow thru down to steps #18 thru #20 where it tells you how to do that 'bypass'. You need to solder a wire across the two rectangular pads on the bottom of the motor driver card that made contact with the slider you removed with the weapon gearbox. Each step in the guide is there for a reason -- don't skip any! A: [Mark J.] The 'Deadblow' Metal Mechanics model has four very small machine screws and nuts holding the top panel down to the side panels. A drop of Loctite on the threads should do very nicely. Loctite recommends their Purple #222 threadlocker for small screws like these, but I've used the more commonly available Blue #242 threadlocker on small screws with good results. A: [Mark J.] The 'turnkey' version of the Kitbots 'Saifu' is fully assembled and ready to use. It is complete with battery, charger and 2.4Ghz radio. You'll need to figure out how to properly use the battery charger (the Ask Aaron LiPoly Battery FAQ can help you there) and familiarize yourself with the controls of the robot. You'll want to read the radio manual to learn about the adjustments available on the R/C transmitter to allow you to match the response of the robot to your liking, but no programming of the robot is required. I don't know what instructions come with the 'Saifu', but if you get stuck you can always call on 'Ask Aaron' for help. The price of the turnkey Saifu robot is $740 plus shipping (as of April, 2016). Less complete versions of the Saifu are available if you have the skills to complete the 'bot yourself. See the Kitbots website for options. Have a look two posts down this page for a rundown of all the current antweight and beetleweight combat kits. P.S I am sorry for your loss, I am also sorry for not saying this sooner. I know what it is like to lose someone you love and that it is typically better not to mention it. A: Thank you for your note of condolence. I miss Aaron greatly, but I find comfort in continuing our project here at 'Ask Aaron'. The Kitbots 'Saifu' is constructed largely of Ultra High Molecular Weight (UHMW) Polyethylene plastic which is remarkably tough, slick, and resilient. One thing it does NOT do well is hold paint. Standard spray paint 'puddles' on the surface and simply flakes off when dry. DO NOT SPRAY PAINT POLYETHYLENE! There is special spray paint for plastic that will stick to UHMW fairly well, but wherever your opponent hits you the paint will scratch away and leave a bright mark that looks like real damage for the judges to see. I advise that you do not paint the polyethylene parts of your robot. The weapon drum will also take a lot of very hard impacts that will quickly rip the paint from the surface. I'd suggest leaving it unpainted as well. You'll need to learn how to take the robot apart to perform routine maintenance and to replace parts damaged in combat. 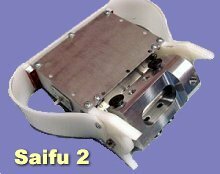 If you want to add some paint to your Saifu you can remove the upper and lower aluminum plates by taking out a few screws. Spray paint the plates, let them dry, and re-attach with the screws. About spray paint and robot internals: most parts won't be bothered by a little stray spray, but show your 'bot some respect and take the time to mask off things you don't want paint-spattered. In particular you don't want to get paint on/in bearings, electrical connections, and surfaces that get hot (motors, speed controllers). A: [Mark J.] You're not making it easy -- a toy chassis not intended for combat, no tools, a low budget, an ineffective overhead axe weapon, and I'm guessing that this is your first robot. You're going to need at least some tools to drill and mount the gearmotors and carve clearances for the weapon in the steel top cover. Realistically it isn't going to be competitive against high budget, custom built, spinner-weaponed antweights. I pulled my 'Deadblow' out of the robot collection for a look. It weighs 10 ounces without any drive motors, radio gear, or functional weapon. It's 4.5 inches square and a scant inch thick. That doesn't leave much weight or space for the conversion. If I were doing it I'd raid FingerTech Robotics for the parts: a pair of FingerTech 11:1 'Silver Spark' gearmotors driving their 1.5" Snap Wheels and Hubs, a pair of TinyESCs, and perhaps an HXT Metal Gear Servo to power the axe weapon. Add a 7.4 volt battery and an R/C setup of your choice and that's about as good as you're going to do with a small budget and off-the-shelf parts. Still, it's unlikely to last more than 30 seconds in combat. You might want to rethink this. Q: Hello Mark, it's the Deadblow Metal Mechanics guy again. I have taken your response into consideration and would like to know what is my best option for a chassis? With the same setup and conditions. Thank you sincerely -Luke from Alabama. A: I don't know enough about your building skills and actual budget to suggest a specific chassis design -- see Frequently Asked Questions #4. Go take a look at current successful antweight robots: click on a name; click on "Search for this bot at the BuildersDB.com", then click on the photo to enlarge. There may be a link to the team webpage as well. Put together a design you like and that matches your construction skills. Keep it simple. Tell me about your design and I may have some tips and adjustments, but I can't design it for you. If your budget is really low, you may want to consider an R/C toy conversion -- browse this archive for some ideas. Q: Hello Mark. This time I was wondering if it would be better to use motor mounts rather than bearing blocks for mounting silver spark motors on the chassis. Oh I forgot to mention that I intend to participate in the Beetleweight class, my bad. Thanks, Luke from Alabama. P.S - I realize using this toy chassis is a terrible idea but, I have a "secret defense" (that will probably break) to solve the issue. Also I realize that axes and hammers are inefficient weapons but, I don't want to build what everyone else is building (wedges, flippers, spinners etc.) Thanks, Luke. A: You don't have room in your chassis for either the FingerTech Bearing Blocks or the Flat Motor Mounts, Luke. They're too tall and likely too wide to fit. I think you'll be fine with the compact L-Bracket Motor Mounts. For a beetleweight with two motors and 1.5" wheels you'll want to switch to the 22:1 gear ratio Silver Spark motors. The 11:1 Silver Sparks could stall with that much weight on the drive wheels. You have enough weight allowance to go to four motors if you have enough budget. This may not be a 'terrible idea'. With a 3-pound weight limit you should have enough allowance for some decent protective armor and a thick front wedge that may keep you from turning into instant road kill. Best luck with the 'secret defense'. There's a very limited market for combat robot kits. They come in and out of stock and can be difficult to obtain due to parts availability. Kits come in a wide range of completeness, and some are definitely not for beginners. The FingerTech 'Viper' is complete with all electronics and has available active weapon upgrade kits. The Kitbots drum-weaponed robots are very potent competitors, but they fall into the 'not for beginners' category. Various kit levels are available, up to complete turnkey robots. 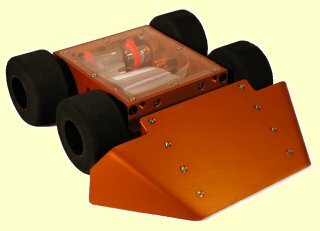 The ROVParts kits are simple wedge robots that require radio gear, speed controller and battery to complete. They're very pretty, but expensive. 1049g (37.0oz) if entering the Beetleweight (3lb) weight class. A: [Mark J.] You asked versions of these questions earlier in the week, Missouri. They were promptly answered. If you'll be so kind as to look down the page just a bit you'll find the answers to them, plus one other question you asked that you seem to have forgotten about. Like most R/C toys, it's designed for speed rather than pushing power. The tires are very low traction material to spin free on smooth surfaces rather than grip and bog down the motors. It's pretty large and pretty heavy -- 15 inches long and just under under 5 pounds. The twin motors are 12 volt versions of the RS-380 and the drive gears/axles are plastic. That's too heavy for a beetleweight and not nearly powerful or durable enough for a hobbyweight. It has a 27 MHz AM radio system that may not be acceptable at any specific tournament. Replacing it would require a new transmitter, receiver, and motor controllers. By the time you made all the needed modifications I don't think there'd be anything left of the original vehicle. 'Cheap' and 'Combat Robot' don't go together! I can say that the current version of the FingerTech Viper antweight kit is 'good', but I wouldn't call it 'cheap'. I don't know of any other complete combat wedge kits available at the moment, and the Viper is on back-order. Q: does the terminator sumo robot kit have everything you need or do you have to buy some items seperatly ? A: You've been asking about combat robot kits, Missouri. Sumo robots are VERY different from combat robots, and you aren't going to have success in combat with a sumo kit. To answer your question, the Terminator sumo kit is not complete. It requires battery, charger, R/C transmitter, R/C receiver, and motor controllers. You'll also need to replace the VERY slow motors and fabricate a wedge or other weapon. If it was suitable for your purpose I would have mentioned it. A: [Mark J.] Inertia Labs stopped making their antweight chassis quite some time ago and all commercial stockpiles are gone. You might ask around on the forums to see if anyone has one in their shop that they're willing to sell. A: The Air Hogs Hypertrax is marginally light enough (about 140 grams) to be a fairyweight, but you'd need to lighten it further to allow for a passive weapon. No active weapons with the included radio! The Hypertrax are geared for speed, not pushing and controllability in a small arena. The deep-grooved vinyl treads are not well suited for grip on a smooth insect arena floor. If you replace the treads or coat them with a higher-traction material (like silicone rubber) the motors will likely stall when pushing. The treads offer a very inviting target for spinner weapons. If you just want something to throw in your pit box to enter the fairyweight class for fun, I suppose a Hypertrax would do, but I don't see any reasonable way to overcome its problems and turn it into a serious competitor. Give it a try and prove me wrong. A: [Mark J.] Exactly which combat robot 'kit' was first depends a lot on exactly how incomplete a package you're willing to accept as a kit, Nate. 1 hex wench and hardware. To complete the kit you needed: speed controllers, radio gear, servo leads, armor of your own design, a weapon blade, a 9.6 volt battery, and a battery charger. The chassis was constructed by strapping the carbon rods to the gearboxes and to each other with the Kevlar thread and soaking the junctions with cyanoacrylate glue. This was not a task for an inexperienced builder, and I suspect that many of the purchased kits were never completed. The Robot Marketplace had been offering 'Robot Starter Packages' in assorted weight classes for some time prior to the appearance of the VDD kit. These packages were complete sets of components -- motors, gearboxes, wheels, speed controllers, battery, and charger -- but they left the chassis design entirely to the builder. A: [Mark J.] I'm not sure he was 'first', but I think we can credit Infernolab's Jason Dante Bardis for proving the worth of BattleBots toy hacks in competition and popularizing their use. 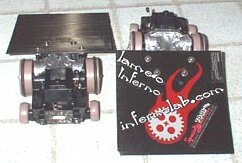 Jason's twin hacks 'Lame-O Inferno' and 'Same-O Inferno' were built in June, 2002 and had great success in the early days of antweight combat. My robotics program at my school is going smoothly, students are currently modifying existing Fingertech Viper kits to modify them with basic weapons. One student, a senior, wants to build a Hazard style overhead bar spinner (except he will use a saw blade for convenience purposes. These bots will never compete outside of the classroom so Massive KE impact is not needed.) What do you think would be the best way to go about doing this? We do not have a machine shop at the school but we do have basic tools: Access to a drill press, vise, reciprocating saw, Dremmel and tin snips. Shall I say it's the good old fashioned way? A: [Mark J.] Good to hear from you, New York. The entire structure must be well supported. Given the lack of machine tools and my own appreciation of simple design, I'd model the weapon after the existing Viper Spinner Addon kit and turn the 'bot upside-down. Using a low-profile outrunner brushless motor direct-driving the FingerTech blade hub solves most of the critical design issues. The blade will spin too fast for best bite, and the spin-up time may be a little long -- but it is a simple and fairly rugged solution. Shouldn't you guys be working on more 'Sportsman Class' style weapons? Spinners are going to cause a lot of damage. I'd make him spin a Popsicle stick. Q: The bots will actually have a weight of 2 pounds allowed to reduce the weight constraint. The kid wanted to do a hazard style where the bot has to go up the wedge for contact (though hazard did not actually have to have his bots go up into the blade). With this in mind, do you think he could still stick to a overhead bar or should we tell him to go for the under cutter from finger tech? As a matter of fact, he will be required to spin a piece of balsa wood before hand so he will indeed be spinning something like a popsicle stick! A: By all means encourage the student to construct the weapon he wants -- that's the best way to learn. My concept is to mount a small brushless outrunner motor to the chassis in the holes provided for the undercutter weapon, then flip the chassis upside-down to put the weapon in an overhead spinner position. If your opponent happens to be more vulnerable to an undercutter you can turn the 'bot back rightside-up. You can order the whole undercutter kit from FingerTech, but it may be less expensive to buy the blade hub from them and order the motor and controller direct from Hobby King. If you really want to mount the weapon to the top panel you should either replace the Lexan with something sturdier (aluminum, garolite, carbon fiber, plywood...) or construct a mounting bracket that attaches to the base chassis. Lexan doesn't do well with high loadings and small bolt holes. I dug out a couple of the old Battlebots RC toys from the garage. They ran awhile and then stopped. I turn them off, then on and the LED on top lights briefly and then goes out. New batteries don't change this behavior, so I followed the instructions on your site to take one apart and remove the impact spring with a pair of pliers, thinking it was stuck to the side. It wasn't but I took it out anyway. A: [Mark J.] The first thing I'd look at is the interlock that keeps the robot from operating when the weapon module is removed. That may have oxidized/corroded over time and may be causing trouble. Try cleaning those contacts, or just short around the switch (see the Robot Dojo BattleBot Toy Hacking Guide, just below the section on the impact spring). A drop of oil on the motor bushings couldn't hurt -- they may be binding a bit and overheating the motor controller, causing a shut-down. Make sure everything turns freely. I'll keep thinking -- write back if no joy. Reply: That was it - the interlock was oxidized, scraping it fixed the problem. The odd part is that they both worked for awhile and then stopped. I hadn't taken them apart, but then again they're several years old and hadn't been run in a long time, so maybe dust built up and eventually blocked the contact. I'll take the other one apart later and it's probably the same thing. It greatly saddens me to announce that my son, Aaron Joerger, died very suddenly on the afternoon of October 18th, 2013 of an apparent pulmonary embolism. He was 22 years old. Aaron's obituary. The 'Ask Aaron' project was important to Aaron, and I have decided to continue the site in his memory. Thank you for the many kind messages of sympathy and support that have found their way to me. A: The lightweight BattleKit is as close to a fully bulletproof chassis as you can find. It is entirely suitable for the 30 kilo weight class. A: Yes, the BattleKit at 66 pounds and 5.6:1 gearing with 4" wheels (as supplied) will break traction well in advance of stall, at less than 30 amps per motor. BatttleKit designer Carlo Bertocchini knows very well how to design an optimum drive train, and has done a fine job with the BattleKits. You should become familliar with the Tentacle Drivetrain Calculator to run these calculations for your own satisfaction. Q: I have read on your archives about the "Optimum Gearing" but I need clarification on your statement "allow them to 'break free' and spin well before motor stall torque is reached". Does that mean with the optimum gearing, before the stall torque is reached the tire will spin so the robot does not move? How is this going to be an advantage to the robot when it goes pushing head to head with the opponent? I'm afraid I have misunderstood your statement, so i guess its better to get an explanation. Thanks. A: Your interpretation is correct. A wheel with a given amount of weight pressing down on it can only transmit a given amount of torque to the arena surface before it starts to slip and 'break traction'. When the robot is pushing hard against a resisting force, a properly geared robot drivetrain will exceed that given amount of torque and the wheel will start to slip. You're still getting the maximum pushing power as the wheel spins, but by allowing the motor to spin you aren't cooking the motor and speed controller by pulling too many amps near stall. You still get max push! Q: Do you know where I can find a cheap, full function R/C car about the size of an antweight? I won't be mounting an active weapon, nor be entering it in any tournaments, I plan to just take a few of them for a backyard fight. A: Take a look at the Tonka Trickster R/C toys: 'Buzzsaw', 'Zig-Zag', and 'Rampage'. They're skid steer, about antweight size, and they plug into the transmitter to recharge. Price is around $20. Browse thru this archive for more toy conversion options. Made really great antweight hacks. Now quite hard to find. A: The FingerTech kit is largely a collection of components and raw materials that requires a good amount of fabrication and finishing to turn into a combat robot. It is suitable for a builder with good basic shop skills and a collection of suitable shop tools. The quality of the finished robot is likely to vary greatly with the skill level of the builder. I would not recommend the kit for a novice builder. Review the kit instructions and make a realistic decision as to whether your building skills are up to the task. Mark J. here: one comment on the construction techniques used by the kit. The design calls for mounting holes to be drilled very close to the edge of Lexan armor, placing high localized stress on the Lexan and possibly causing cracking and break-thru in those areas. I would suggest cutting the Lexan wider and/or changing the mounting points to move those high-stress areas further away from the armor edge. Maybe you don't need their kit. Q: Do you have a tutorial on how to hack the Biohazard toy? A: I don't have a step-by-step tutorial, but there are some photos and a description of the modifications we made to our own hacked Pro-Series Biohazard on the Zpatula page. Much of the process involves replacement rather than 'hacking'. The radio system and motor controllers must be completely replaced to comply with active-weapon failsafe requirements. The only real 'hack' involves locking out the torque limiter in the lifter gearbox -- something we cover in this archive. Search for 'slipper clutch'. I'll be happy to help you work thru the conversion. Lock out the slip clutch. After using the calculator (if i got it right), the amps per motor to spin wheels is 29.7amps and the peak amps is 59.5. Based on this data, i am thinking that i can use the ESC that i already have which have the operating capacity of 40amps and peak amps of 80amps. But i'm afraid that i got the calculation wrong and i do wonder why they suggested an 160A esc? One more concern, is the 4" rubber colson wheels good enough? Because they also list down in the add on option, the plastic wheels which cost a little bit more. I have not used colson wheels before but i have use banebots wheel. How does the colson wheels perform in comparison with the banebots? Hope u can advise. Thanks! A: Your calculations are correct -- each motor will pull about 30 amps before the available torque spins the wheels and stops greater current consumption. Combined amperage consumption of the two motors together pushing against an immoveable object at full throttle will be about 60 amps. Why recommend a 160 amp ESC? It is possible for a drive wheel to be physically prevented from rotating by mechanical interference, perhaps from crushed armor or a bent shaft. If that happens, your motor can pull far more amperage than it might under normal operations. Some builders like to cover all contingencies. It's your choice, but you'll probably be fine with your current 40 amp ESCs. I could be more positive in that recommendation if you'd mentioned which ESC it actually is -- some ESCs have amperage limiting circuits to prevent damage to the ESC, and some do not. Colson wheels are very tough and quite grippy in most conditions. They are much stronger than the BaneBots wheels and are entirely suitable for use in your robot. Q: hey aaron, My brother and I hacked some Battlebots toys into antweights. Our local tournaments are not allowing AM radios at all, rather than make a new robot we're going to add 2.4Ghz receivers. I see you added a ACTUAL receiver in your Biohazard converted Beetle weight. How would I go about doing that to our custom series robots? A: Your event organizers are being way too tough on you, Henry. There is very little excuse to demand that passive-weaponed insect 'bots run complex radio systems. The BattleBots custom series toy has a combined receiver/motor controller that will not interface with a hobby receiver. If you have to swap out the radio, you'll also need to replace the motor controller -- take out everything between the batteries and the motors and start over. The schematic in #19 may help. The good news it that true proportional speed control will make the 'bots much more driveable. Q: can i purchase a pre-assembled chassis with tracks, with radio or not? A: Inertia Labs offers a Treaded Drive Base [no longer available]. Add your choice of radio, battery and speed controller. Q: What are your thoughts on the kitbots weta kit? is it a fairly good place for a beginner to start? A: Quote from the Kitbots Weta page: "This is not a kit for absolute beginners and will require extra parts and tools to complete." For $150 you get a bare beetleweight chassis. For another $120 you get a small beater bar impactor, shaft, bearings, and pulley. You need to add: drivemotors, weapon motor, drive and weapon ESCs, battery, weapon belt, weapon motor pulley, wheels, hubs, radio system, and battery charger. Putting it all together is entirely up to you -- no diagrams or step-by-step instructions. It would be an expensive beetleweight, but if you have the skills to complete the kit it could be a good competitor. Q: for a beetleweight, do you think an R/C [toy] hack would be decent? If so do you have a model in mind? Thanks. A: See 'Zpatula' -- it's decent. Q: I am soon going to hack/modify a battlebots custom series toy for robotic combat as an antweight and I was wondering about the wheels. Are the ones that come with it good, or should I buy some different ones? If the later, which ones do you recommend? A: The BattleBots toy wheels are pretty good. They're hard plastic with a large rubber O-ring set into a groove. Replacing them would be difficult because the hubs are non-standard. Most of the hacks I can recall used the wheels that came with the toy. The wheels are a 'snap fit' onto the hubs, so consider adding some additional fastening security! Be sure to read the Robot Dojo BattleBot Toy Hacking Guide for some great tips. Robogames eliminated the 30-pound featherweight combat class for 2012 and they have no plans to reinstate it. They eliminated the 12-pound hobbyweight class in 2008, so there are currently no 'sub-light' classes at Robogames. The only current combat-worthy sub-light complete chassis kit is the GEARS-HMC. It weighs in at 10 pounds, is very slow, and last time I checked was right around $500. Not recommended. I think you're gonna have to build your own chassis, and not a feather or a hobbyweight if you're going to Robogames. Q: Dear Aaron, I saw the question about the Gears HMC bot, and I was wondering if you could elaborate about that robot. Also, what do you think about it as a robot education system? Do you know any bot that uses it/any video of a bot that does? Thanks. A: The extent of my knowledge comes from their website. I've never had 'hands on' one of the GEARS HMC chassis and I'm not qualified to comment on 'robot education systems'. The GEARS website shows pictures of two apparent combat robots that use the HMC chassis but I don't recognize either of them -- they may be BotsIQ competitors. The kit is a bare chassis: no batteries, no motor controllers, no radio gear. With the supplied motors, wheels, and sprockets it would be slow: about 2.5 MPH with a 3-cell LiPoly battery. A complete combat robot built around this chassis would be expensive. Q: In an earlier post you said the BOE Bot would not make a good hack for an antweight combat robot. Would it work for an anonomous combat antweight? A: We claim no expertise in autonomous combat, but the Boe-Bot has pretty much no components that are suitable for combat. It's slow, unprotected, top-heavy, and made of soft materials. It has enough computing power to respond to sensor input, but you'd be far better off to start with a BASIC Stamp board and build a robot around it with suitable combat components. Q: Would you recomend a toy with car steering for an insect weight hack? A: Generally, no. Ant arenas are small and the advantage of zero-radius skid steering is too great to give up. A: A quick search on Amazon.com found one of the Fly Wheels R/C toys. They are out there. Q: Can i use it (round one) as Thwacker? A: Yes - (video) - assuming it meets the requirements for the rules your event is using. Q: Are there is good way to learn how to use thwackers? A: You could watch some videos of thwackbots in action, but there really isn't a lot to it. All you can really do is drive to a clear spot in the arena, start spinning, and hope somebody wants to drive into your weapon. Build one and practice. Q: Should I use HDPE armor for it and add some kind of side hammer/pickaxe/whatever to it? A: I don't know anything about your event, your competitors, or the details of the design you have in mind. The hamburger might be bad. HDPE is in general a good armor material for light robots, and if you're making a thwackbot you'll need some sort of thwacker. Q: Sorry,i haven't given full information. i plan to use it as Ant. i have design of spinning round thing with some sort of weapon end on it. also,im using fly wheel chassis. that is information. If you need to know more,please tell me. The weight limit for UK antweights is 150 grams. I don't have one here to weigh, but I'm pretty sure that the Fly Wheels toy is quite a bit too heavy to meet that limit even with modification. It's not entirely clear that Roaming Robots allows 'toy' radio systems. All of their radio examples are 'hobby grade' systems. Best to check with event officials. If toy radios are allowed, note that the Fly Wheels toys come in both 27 MHz and 49 MHz radio frequencies. The 49 MHz band is not approved for Roaming Robots competitors, so don't buy the wrong frequency. I have doubts that the Fly Wheels is going to work as a starting point for your robot. Q: I plan to go out of japan and go to robot combat. Can i just go to US and fight there? it seem a good idea. Also,Thanks for information! A: If I was going to take a special trip of thousands of miles to participate in a robot combat event I think I'd invest more than $35 in my robot. But sure -- come on over. I'll clean off the dining room table and we can fight antweights all afternoon. Q: Are there any toy R/C toys out for sale that you would recomend for an antweight hack? I can't seem to find any BattleBots toys anymore on EBay. A: The Tonka Trickster miniature R/C toys (Buzzsaw, Zig-Zag, Rampage) look like they could be a good hack. They are two-wheel drive skid steer, about antweight size, recharge from the transmitter, and are very quick. I think you could make something out of one. 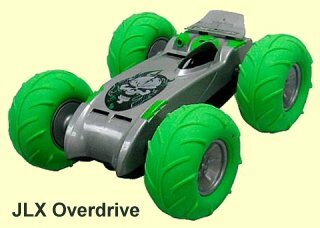 Q: If I were to use a design like 'Overkill' or 'Toe Crusher' for a beetle, could i use a toy R/C car and make it legal? A: A 'torque-reaction hammer' weapon (discussed in the archive) is not considered to be an 'active weapon'. Robots up thru 12 pounds can legally use an AM or 'toy' R/C radio with a design like the robots you mention. Q: I'm building a combat robot by hacking a toy rc car. I plan to add a cutting board to the sides and top for armor and a wedge to attack. What would be the best way to mount these to my hack? A: Without having the toy in front of me I can only talk in general. I'd suggest forming a box out of the armor and wedge with well reinforced corners. Additional strips of armor material can be cut to 'fill the gaps' to the toy chassis where it can be mechanically fastend with screws/bolts/nuts. Fasten over a large area across the strongest points of the chassis. A: Welcome to the soldering brotherhood, New York. I don't know what design or weaponry you're planning, but I'm fond of polycarbonate (Lexan) and UHMW polyethylene plastics for insect class armor. They're inexpensive and easy to work with hand tools. About 1/8" (0.125") thick for a starting point. There are many posts about the use and mounting of plastic armor in the Ask Aaron archives. Q: Is this 'Overkill' toy (eBay auction link) remote controlled or just electric powered? A: The toy is one of the 'Metal Mechanics' series kits. The weapon and only the weapon is powered by a small electric motor -- the robot itself is not mobile and not R/C. Seven robots are available: Backlash, Deadblow, Mauler, Minion, Overkill, Ronin, and Tazbot. None are suitable for conversion to combat. Q: I just ordered a Finger Tech Viper and I want to put a wedge on it. Could I use a pair of dollar store putty knifes and bolt them to the bottom plate, like a dust pan with out the sides? A: That's not a bad start, but you'll need some additional armor to go with it. The Viper will not hold up against impacts from robots running up your wedge and into the vacuum-formed body of the robot. Note that some arenas have gapped floor seams that can make life miserable for thin, sharp nosed drag wedges. Best to investigate the arena before settling on a wedge design. We have some comments about the Viper kit farther down in this archive. Q: I'm the viper kit guy again, will a dollar store tuppa ware container work as some armor, provided I let it flex? A: If I understand your design, you're going to need something much more substantial than a sandwich box to stop a spinner running up your wedge. The Lexan body that comes with the Viper is stronger than a dollar store plastic food container. For front armor you're going to need something hard enough that a spinner blade can't 'dig in', and it has to be very well mounted to the baseplate. I know the Viper is sold as a combat robot, but it needs a lot of help before it can stand up to serious competition. Q: I noticed that Inertia Lab is now only selling tracked kits. Is it possible to just ditch the tracks and have the kit run on regular surveyer wheels? 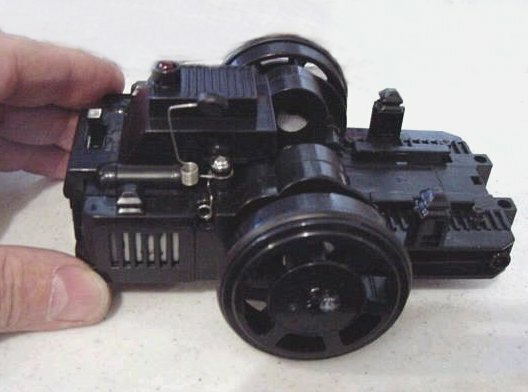 A: The wheels and tracks are interchangeable on the Surveyor base chassis. Q: Dear Aaron, (in response to the post below) 6 volts seems kinda low for a toy the size of the [BattleBots] pro series [toy]. Am I wrong? I mean, I got it and It isn't massive, but I have other toys that are around the same size that use a 7.2 volt six cell NIMH battery which appears to be much larger than what is recommended on line. Did you find the 6 volts good for this toy? If I want a little more (but not too much) more voltage, what would be realistc? And if I were to increase the power, is there a battery that would fit the same way as the normal 6 volt? I have not used the toy yet, but I want to make sure I order the optimal batteries since they are pricy. Thank you. A: Power isn't measured in volts, but in watts -- you cannot estimate motor output from voltage alone. I've answered your battery question twice previously: the 6 volt battery is fine. Tyco-style clip-in style battery packs only come in 6 volts. For more voltage you would need to splice in a new connector to match the new battery. You already know that I run my combat hacked Pro Series toy at 7.2 volts, which I would consider to be overkill outside of combat. Buy a Tyco battery and charger, try it, and don't ask the same question again. Q: Dear Aaron, i got the two [BattleBots] pro series toys and they seem to only run on 6v but you run them on 7.2v. Is this good? How do I do this? A: For your purposes, I'd suggest running them with the standard 6 volt battery pack. More voltage will give more torque and more speed, but will also reduce the life span of the motors and make the robot trickier to control. I've seen hacked BattleBots Custom Series toys run as high as 11.1 volts in competition, but the toys are plenty quick without modification. If you want to run a higher voltage, all that's needed is a higher voltage battery pack. Our own hacked Pro Series beetleweight Zpatula has a custom 7.2 volt NiMHd battery pack. To make 'Zpatula' legal for competition we also replaced the toy electronics with: an FM radio, a SOZBots ESC for the drive motors, and a Team Delta dual-relay board for the lifter. These modifications provided more precise control and were necessary to meet the safety requirements for a combat robot with an active weapon, but are certainly not required for personal use. Q: Dear Aaron, I am confused. Do you recommend the 7.2V? And also, which types of batteries for which motors? Just asking for some clarification... No problem at all! Thanks. A: It depends on what you plan to do with the toys. ==> If you're going to use them as toys, keep the 6 volt packs. <== If you plan on competition, you may want to replace the batteries with a lighter and/or higher voltage pack as part of the conversion process. Try the 6 volt pack and make a realistic judgement on just how much more speed/power you could use in a small arena. I don't understand 'which types of batteries for which motors?' Your Pro Series toys use a single battery pack to power three identical 130-size motors: two for propulsion and one for the weapon. NiCad, NiMHd, or LiPoly cells will do nicely. Q: Dear Aaron, thank so much for the help with the batteries on the Pro series toys! I love this website, and I recommended it to some people at NERC. I have (hopefully) my last question, which is do you have a specific 6v battery that I should purchase for the Pro series? online, I am seeing batteries with wires for the attachments to the bot, which I know I do not want. You have to plug it right in. Any specific recommendations? Thank you! A: The BattleBots Pro Series toys are designed for the standard Tyco 6.0 volt battery pack. It clips right into the battery compartment. A web search for 'Tyco 6 volt' will come up with plenty of sources for Tyco battery and charger combos. A: Sure, that's the Inertia Labs antweight kit. There are several posts about it in this archive. Q: How dangerous in terms of touching and safety are the [BattleBots] metal mechanics [toys]? A: About as dangerous as an unopened can of soup. They have no sharp edges, motion speed is slow, and power is tiny. They do have small detachable parts, so not suitable for very young children. Q: Dear Aaron, What is the most high end, pre built fighting robot toy and or bot I could get? I would be willing to 'shell out' on it because I love combat robots. I would include an easy to use kit as also an option. the closest I can get to the real thing! A: If you want to go 'high end' you'll want to take a look at BattleKits. These are the real thing, and they are not cheap. They come without armor and weaponry but, assuming that you can bolt on a wedge and a top armor plate, one of these will float your boat. A recent post in this archive covers some other toy and kit options. Give it a read. Q: Dear Aaron, did Roaming robots stop making the high end version of their kit? A: The Roaming Robots 5 KG 'BattleRat' kit is no longer available. Just as well. Q: Of all of the Custom series toys, which one is your favorite? Least favorite? A: My only interest in the custom series BattleBots toys is in hacking them for insect class combat. They are all alike under the skin, with minor differences in the wheels. The 'Dr. Inferno' toy probably has the best wheels, but any of the wheeled robots will do well. Avoid the tracked 'bots ('Do-All' and 'El Diablo') for combat. Have a look at the Robot Dojo BattleBot Toy Hacking Guide. Q: I've tried to find any Battlebots RC toys but i cant find any. Do you know a place or website that sells them and is not sold out? A: Previously answered: a few weeks checking auctions on EBay should get you positive results. Q: Dear Aaron, I was doing extensive research yesterday of kit robots and I came across kitbots.com. What do you think about them, as in, do you recommend them? Which ones would you recommend? To finish, have you ever heard of these? I got no results on Ask Aaron, which is unusual for anything bot. This is my favorite website hands down for robot fighting!!! I recommend it to my friends. No joke. Thank you so much for the gift of this website. A: Thank you for the props. You're very welcome! Team Rolling Thunder has been marketing robot pieces and 'kits' for quite a while. The team website still has their old product info up -- the kitbots.com site is relatively new. The only complete kit they offer is a Lexan hobbyweight wedge that is suitable for bot hockey or educational purposes. The website itself notes that the kit is not 'combat ready' as provided and would require additional armor and reinforcement before combat competition. At $799, I cannot recommend the kit for someone wanting to build a combat robot. Hobby bar spinner chassis [$200]. These are not kits, just starting points. You will need to provide motors, mounts, drivetrains, controllers, batteries, wheels, hubs, hardware, radio gear, and considerable mechanical construction skills. There are no detailed instructions. Beetle weapon blades/drums are available at extra cost. Completing one of these chassis would not be inexpensive, and it is not a task for a beginner. Do you have a recommendation for a robot toy or if 'necessary' a kit that simulates robot fighting from tv. I was interested in in the battle bots pro series but I cannot find one for sale any more. -Please Help. Thank you very much!!! A: The BattleBots Pro series toys would be by far the best choice to offer a reasonable simulation of robot combat. Anything else is just R/C toys pushing each other around. Of course they are toys and you aren't going to get metal-rending destruction. Our successful beetleweight lifter 'Zpatula' is a modified BattleBots Pro 'BioHazard' toy. You can still find them from time to time on EBay -- be persistent. A: As noted, the BattleBots Pro series toys appear 'from time to time' on EBay -- in my experience perhaps every few months. Persistence requires patience. Team Run Amok does not compete in sumo. Q: Do you sell any robot kits/parts?Thanks! A: We do not sell any robot components, nor do we accept promotional consideration from those who do. We prefer to keep our advice unbiased. Q: Breaking news!!!!! I found an unopened bio hazard for sale on Ebay! [link removed] It is 169$. is that over priced? Thanks!!! A: Well, that didn't take long. The Pro Series toys originally sold for about $60, if I recall correctly. You found one still in the original box, which at this point probably makes it collectable. I can't say if that is overpriced, but I can say I have seen them sell for less. Please do note that the Pro Series toys do not come with the required NiCad battery pack and charger. These are common items designed to fit a variety of R/C toys, but you will need them to make the toy operational -- at some additional cost. Q: Are there any videos of the Pro Series Disector and Bio Hazard in action? I am interested in how they drive and how good their weapons are (More specifically the biohazard flipper). A: I know of no videos. There is an extensive and accurate review of the Pro Series toys, with photos, at this site. Q: Hello Aaron, I read the article on the [BattleBots] Pro Series. I saw that the weapons for both of them were bad. More specifically, is there a way for them to lift better? Every year I enter a sumo competition and this platform may be good for a toy and sumo. So is there a way I could really make it lift the opponent well? The article says the weapon isn't strong enough. Any other ideas/ recommendations? Thank you!!!! A: The BattleBots Pro Series toys were designed to survive abuse by children. The lifter mechanism includes a clutch that slips well before the lifter motor generates full power to prevent melt-down when little Bobby tries to lift the couch. The clutch mechanism can be locked out by replacing the clutch spring with a rigid spacer cut from brass tubing. For our beetleweight hack, we locked out the clutch and eventually replaced the 130 size lifter motor with a 180 size motor for additional torque. Other modifications we made are listed on the 'Zpatula' web page. A: All of our notes on Pro Series modification are on the 'Zpatula' web page. Q: with the slip clutch disengaged, how much better would the bot lift and push? Would it be able to flip another of its own weight? the site said that it could not even lift its own weight class... Thank you so much!!!!! A: Lifting is greatly improved. Power is adequate to edge-lift a beetleweight opponent. Lift height may or may not be adequate to turn over your opponent, but combined with forward motion of the robot it becomes an effective weapon. The slip clutch governs the lifter only -- it is not involved with the robot drivetrain. Pushing capacity of the drivetrain is entirely adequate as-is. Q: Speaking of flippers, do you have a recomendation for a flipper robot kit that would be small and have a strong drive power to it? I may use it for fun/sumo bots (Maybe). Anything you can think of? Thank you!!!!! A: I know of no lifter/flipper robot kits currently available in any weight class that I could recommend. The BattleBots Pro Series are nice toys. With patience, they can be purchased for well less than $100 including radio. Team Run Amok has demonstrated that they can be modified to be competitive in open beetleweight (3 pound) competition. The base 5 KG. 'Battle Ratz' kit [now discontinued] runs about $700 without a radio. It is not a toy, but a robot originally designed as an arcade 'you-drive-a-robot' attraction. They compete against other Battle Ratz in a special UK-only combat class. It would, IMO, take considerable modification to be legal and competitive in open hobbyweight (12 pound) competition. The smaller 250 gram(?!) 'Battle Antz' kit is priced at about $100 without radio. In the UK, these kits are allowed to compete in the 150 gram class, but in the US they would compete in the 456 gram (1 pound) antweight class. They are servo powered (very slow compared to US antweights) and use a standard servo for lifter power as well (very weak). They lack the armor, speed, and power needed to be competitive in the US antweight class. Mark J. here: several readers have written in with suggestions and testimonials for various kitbots in response to this series of questions seeking a lifter toy/kit. While we appreciate the enthusiasm and generous spirit of these readers, we do not believe that it is appropriate or responsive to recommend any of the suggested kits given the specifics of the reader's inquiry. The advice given here is exclusively that of Team Run Amok. Readers interested in opinions from other sources are invited to post their questions to the combat robot forums. A: Answered a couple of days ago, New York. Scan up a few Q's. You're asking so many questions you don't have time to read my answers. Q: Aaron, I am sorry I didn't see your response. I didn't mean to waste your time. Thank you very much for the responses. Also, where were the suggestions from other readers? Just wondering. A: Not a problem. We will often attach a 'follow-on' question to the original post that is farther down the page in order to make the thread make sense. This can make it difficult to find new questions, but I think it's best in the long run. We did not print the suggestions from the other readers. As a rule, the only recommendations (or critiques) of commercial products that we publish come from Team Run Amok. We know our motives are reasonably unbiased, but we cannot assume the same for those that come from unverified external sources. If you are interested in sorting thru a grab bag full of answers, you are free to post your questions to one or more of the combat robot forums. FYI, none of the recommendations were for flipper/lifter kits. Q: Aaron,On the Pro Series Biohazard, I'm hoping to use a brushless system and that the gears already transfering power, would give it torque. Is this possible? A: I think the hamburger is bad. Do you want to use the brushless motor for the lifter or for the drive? Which motor(s) do you plan to use? Why do you want to use a 'brushless system'? In general, we recommend brushless motors only for spinner weapon power. We have explained the reasons for that recommendation multiple times -- see #23. Q: I was hoping to use some Velineon VXL 380 motor, a hobby grade motor, because it is use to stoppin because of it doesn't need to be in constant movement. (I've had experience with this in my r/c cars) I was prefering to have it as a drivetrain and have the gearsalreadyin the gearbox to gear it down for torque. A: Mark J. here: the problem with brushless motors in combat robots is not stopping or running at reduced speed at small torque loading -- all brushless motors throttle down perfectly well. The problem comes when the motor must produce a lot of torque at low RPM, like when the robot is pushing hard against another robot. Under those circumstances the motor consumes a great amount of amperage and creates a large amount of internal heat. Hobby brushless motors do not tollerate that type of use -- they melt. In your proposed useage there are additional problems. Like most hobby motors, only very limited specifications are available for the Velineon VXL. From what I can tell it is a high RPM motor (4000 RPM per volt) that delivers about 40 times(!) the torque available from the FF-050 motor that comes with the BattleBots toy. There just isn't any way to make use of that much power in a small insect class arena -- it would be uncontrollable. It also has a very good chance of destroying the gearbox, which is certainly not designed to handle that much torque. Aaron's Pro Series BioHazard hack beetleweight 'Zpatula' finished third at the RFL national championships with the stock FF-050 motors, and additional power would not have improved its performance. Motor overkill is not the path to victory. Save your money. Q: Can you gear down a hobby grade R/C car for pushing power? A: Toy R/C vehicles have fixed gear ratios, but hobby-grade R/C vehicles will have some capacity to change their drivetrain gearing by replacing a pinion and/or spur with gears of different size. The range over which the gearing can be changed is limited and it's unlikely that the ratio can be changed enough to provide adequate torque for robot combat. Q: I bought a toy R/C car I plan to make into a robot.It works fine but the two AAA's it uses dies fast and it can't even steer.My question is:is there any way to add extra batteries to it or modify it so it can use AA's? A: A robot combat match typically lasts 3 minutes -- it's hard to believe that your toy hack won't run that long on a fresh set of AAA cells. If you are determined to get greater run time you can purchase a holder for two AA cells at Radio Shack and wire it in place. Q: Do you recomend combat robot kits? A: See post below and other comments in this archive. Q: What robot kit would you reccomend for 1rst time builders? A: There are no current combat robot kits that we recommend for first time builders. An antweight kit will cost $300 to $400+ and leave you with a pile of mediocre components that you will likely want to individually upgrade for your next combat project -- a poor value. I suggest you read thru this archive for our comments on various kits and other options for first timers. Q: How much does an Interia Labs antweight kit weight? A: I'm sure I answered this before, but I can't find the question. Depending on options like battery size, the complete chassis with all electronics and four motors can be under 6 ounces. That leaves plenty of weight allowance for armor and weaponry. Q: I have an old Battle Wheels toy and I wanted to ask wether or not I should keep the little wheels on the front and back of the toy. A: Whether they are used or not depends on your design. I would generally recommend replacing their function with a skid. 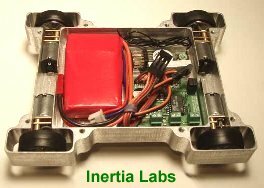 Q: Where can I find an Interia Labs antweight starter kit without buying it online? A: Have you checked the combat robot department at your local WalMart? No luck? Unless you live close enough to Inertia Labs to go knock on their door I guess it's online or nowhere. Q: In the post below there's a picture of a robot made of two 2-wheeled toys. What were they and how did they put them together? 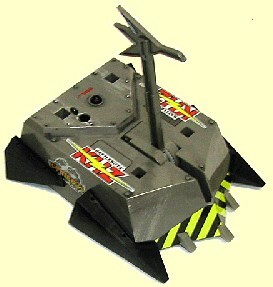 A: Robot Dojo's 'CoMotion' was made from two BattleBots R/C toys -- commonly available in 2002, but quite rare today. The picture came from the Robot Dojo BattleBot Toy Hacking Guide. The two toys were simply bolted together. Note that different models of BattleBots toys came with different wheels, so buy two of the same design if you plan to combine them. Q: What would be a better [toy] hack, a Fly Wheels or a Battle Wheels? A: The two toys have comparable radio systems and motors. The Battle Wheels R/C toy is geared for pushing and could be used with the large diameter wheels it has. The gearing in the Fly Wheels R/C toy is for speed, so it would need smaller wheels to be useable as a combat robot. I guess it depends on how much 'hacking' you're willing to do and what type of design you have in mind. Q: Where can I find a toy hack for a 4 wheel drive robot? I need something with a lot of pushing power. A: Four wheel drive does not guarantee pushing power. Proper gearing and the right tire compound count at least as much as the number of driven wheels. 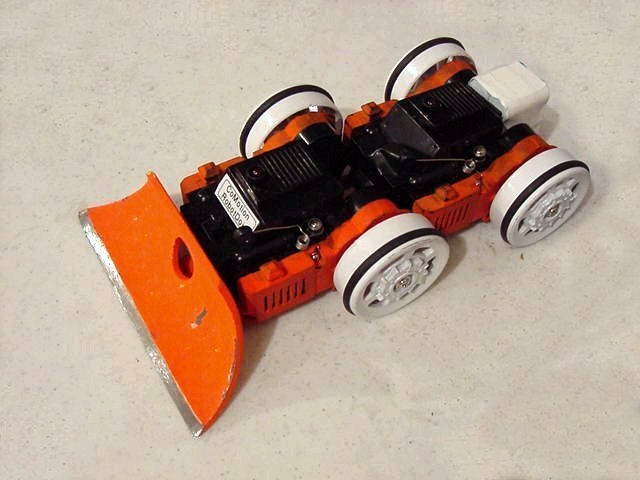 You can try patching two stripped-down toys together to get four-wheel drive - like Robot Dojo's 'CoMotion' (pictured) - but with proper weight distribution a two-wheel drive 'bot can give very close to the same 'push'. Q: By pushing power I was looking for a box shape toy for driving in a staight line and can work inverted. A: I don't know of any hackable toy that meets your needs 'out of the box'. If you're going to hack a toy for a combat robot you need to either make design allowances to suit available toys or strip out the key components and install them in your own chassis. I'd suggest reading thru this archive for idea options. Q: In terms of speed and power, what are your thoughts on the EZTEC 1:64 Super Flipper Stunt RC car for the Fairyweight class? A: I don't have one of those lying around the workshop to evaluate for you. I can't tell you its weight, size, power, durability, or battery life. I can tell you that it has tank steering and an advertised top speed of 350 feet per minute (4 miles per hour). Q: Hi, I am interested in the Battlebots Custom series [toys]. There are 8 different robots and only 6 differnet channels. How would someone hack extra controllers to have all 8 driving by separate people? A: Getting an electrical engineering degree with specialization in communication circuits would be a good start. Adding on channels to radio gear isn't simple and might violate FCC regulations. The good news is that you're incorrect about only six different channels. The Custom Series radios come in 27 and 49 MHz frequencies, each with channels A, B, and C marked on slide switches on the transmitter and the 'bot. Not mentioned in the manual is an unmarked position at the end of the slide switch travel that selects a fourth channel! Four channels times two frequencies equals eight toys running at the same time with no hack needed. Q: I just wanted to take a moment to say thanks for replying. I took a dremmel tool to the plastic and opened up a fourth channel today. Thanks good sir. On some of the toys there is enough switch travel to access the 4th channel without having to shave any plastic away, but a little extra clearance sure wouldn't hurt. Q: I have an old BOE-bot kit. Are there any parts that I could potentially salvage and use in a combat antweight (or similar weight class)? 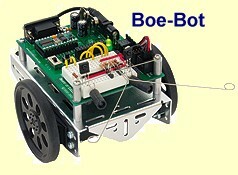 A: The 'Boe-Bot' is an autonomous robot kit by Parallax. It's powered by hacked servos, has no stand-alone ESC and no radio. It's slow and the components are not intended to survive combat. I don't think there's much there that could be used on a combat robot -- better to sell it and start fresh. Q: I curentley have an RC car wege hack-bot-beetleweight, do you have any tips to make it wegier? Grab the elastic band of its underwear. Robot Dojo Hack Guide Restored: I'm pleased to announce the release of a fully restored archive of the Robot Dojo guide to conversion of the BattleBots Custom Series R/C toys to antweight combat robots. All photos are now available and are matched to the original text. Take a look. Q: The Robot Dojo Hack page suggests upgrading to 7.2v NiCad. If I had NiMh instead, what Mah rating would you suggest? A: I usually just build a pack out of 700 mAH 'AAA' NiMH cells for my ants and beetles. You could get by with less than half that capacity, but 'AAA' cells are easy to find and the extra capacity comes in handy if you have a quick turn-around for your next fight. With clever arrangement you can fit 6 'AAA' cells into the existing battery compartment. Q: I have recently received a Vlad the Impaler custom series r/c toy. I have been looking for help on the hacking process, but can only find instructions for SOW. Do know of any websites that are specifically for Vlad the Impaler? Thanks in advance, and if you don't well i guess that's ok too. A: The chassis for the custom series BattleBots toys were all the same. The only differences were the bodies and the wheels/treads. Instructions for Son of Whyachi will work just fine for Vlad. The Robot Dojo BattleBots Toy Hack page is good. Q: Hey Vlad the impaler battlebot toy guy, thanks for the info. But I was wondering would a 7.2 volt AA700mAh Ni-Cd airsoft gun battery work for the batteries? Thanks again. A: A six-cell AA NiCad pack will work, but it's bulky and fairly heavy. You'd need to find a matching connector for the robot or buy new connectors for the battery, the charger, and the robot. Consider using the AA alkalines the toy was designed to use -- performance is pretty good with them. Q: I have completed the vlad the impaler toy hack but now the motors are acting up. They sometimes don't respond or they have delayed reaction time. When they do react they react for too long and that messes up me trying practice driving. Is there anything I can do or do I just have to compensate? A: I have hacked half a dozen of the BattleBots pro series toys and have never had the problems you describe. Make sure your batteries are all fresh, check that you didn't break the antenna wire on the robot, and double check that the frequency channel settings match on the transmitter and the robot. You may need to disassemble the transmitter and clean the joystick contacts to remove any corrosion or oxidation. Fine abrasive paper will do nicely. Q: Vlad hack kid again about the motor trouble, I think it might be the gears they may be slipping. If that's the case is there anything I can do? A: It's unlikely that the gears are 'slipping' -- the gearbox is well designed and there aren't any places where slippage could be a problem unless you re-assembled the gears incorrectly following the removal of the weapon gears. The Robot Dojo BattleBots Toy Hack page has good pictures of the correct gearbox assembly. Click on the small photos for larger versions. Q: Would it be smart to put a battery pack into a Battlebot toy's original battery holder, instead of on the back like the Robot Dojo Hack shows? A: The Robot Dojo hack page was written before LiPo battery packs were widely available. It was difficult to build a NiCad pack of sufficient voltage and capacity to fit in the original 4x AA battery compartment. If your LiPo battery will fit into the battery compartment it would be a good idea to put it there. Q: Hi, Aaron. I own a [BattleBots pro-series] Biohazard hackbot and I was thinking of perhaps putting a rollbar on top to help it self-right. What material is light and strong enough for this? A: No need to go high-tech here. I'd suggest a simple arch of 1/16" steel 'piano wire', available in 36" lengths at hobby shops. The trick will be getting the right shape and position to allow the lifter to operate as a righting mechanism. Q: Can VDD gearbox fit in Inertia Lab's kit? A: The VDD gearbox [no longer available] is too large to fit 'in' the Inertia Labs chassis, but it could be mounted on top. However, I wouldn't recommend a large vertical blade for that chassis -- it's too narrow to be stable with the forces the blade woud produce, and the blade would have to set too far forward in the chassis for good balance. A horizontal blade could work, but the VDD gearbox is too tall for that, I think. Q: How did you lock out the slipper clutch for Zpatula? A: I disassembled the lifter gearbox and located the slipper mechanism: one of the gears had a special sawtooth-ended hub held by spring pressure against matching teeth on the base of the driven gear. When torque reached a specific level the hub would be forced away from the gear and 'click click click' until the load dropped enough to re-engage. I drilled two holes thru the hub and into the gear, then fitted steel pins in the holes to lock the assembly together. An alternate solution would have been replacement of the spring with a rigid spacer. Q: Aaron, can a VEX [robotics kit] be used a starter kit? A: The radio is not suitable for active weapon robots, but you could make something out of it. Q: could I use the Tyco Mutator as a bot? is'nt there a bot made out of one? A: The Tyco Mutator R/C toy has tank steering, but it is geared more for speed than pushing. I suppose you could add a wedge and make a hackbot out of it for fun, but don't expect to win many matches. I don't know of any combat robots claiming to be based on the Mutator. Q: Is the remote control that comes with the Battlebots Biohazard toy ok for combat? A: Check the #18. The lifter is an active weapon, so the AM radio that comes with the BioHazard toy is not acceptable. The Robot Fighting League rules require an FM radio with a failsafe provision for all robots with an active weapon. You could use the toy radio if you took the lifter out. Q: Which kind of FM failsafe control would you use on a BattleBots Pro toy [hacked] to beetleweight? A: If you want to use an active weapon you would need to replace the entire radio system and the motor controller. For reasons I've discussed many times previously (see the archive) I don't recommend going 'cheap' on electronics. A good system will serve you well thru generations of combat machines and will be valuable at resale when you move on. A cheap system may prove unreliable, require upgrading for larger projects, and will be worth little when resold. For 'Zpatula' we use a Futaba T6XAs 75 MHz radio, MicroBotParts FM receiver, and a SOZBots ESC -- but those were used because we already had the radio for use with other projects. If I was starting from scratch, I would recommend a Spektrum DX6i radio with the Spektrum BR6000 receiver and a Scorpion Mini ESC. A: Any robot with an active weapon would need similar radio specifications. Q: If you somehow attached a blade to your wheels instead of a separate motor, would it be considered a non-active weapon? I have an old Battlebots toy and I was thinking about putting some disks onto the gears. A: That's not going to work for you. For events requiring an active weapon, the weapon must be controlled by a separate radio channel -- but for radio failsafe requirements, a rotating blade is considered an active weapon regardless of what powers it. Q: could the stunt phsyco (don't remember how made it)work as a good hackbot? A: The Tyco R/C Stunt Psycho has the elements of a decent hackbot: tank steering, good torque, and durable drivetrain. I'm not sure how much the vehicle weighs with batteries, but I'm sure it's too heavy to be an antweight. The wheels should be replaced with something smaller and more durable. I think you could have some fun with it. 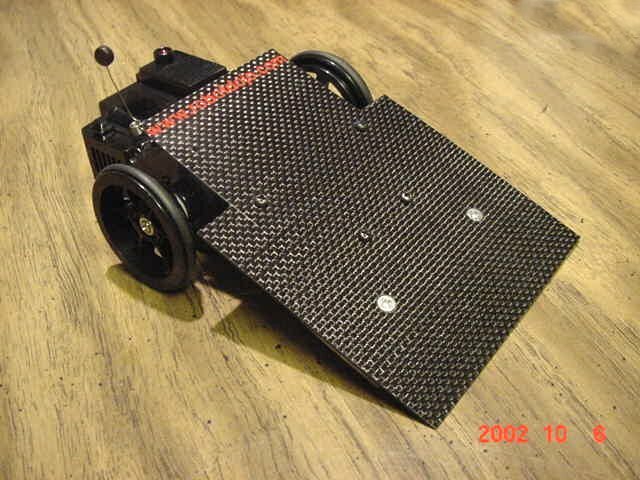 Q: Would an R/C car with a carbon fiber wedge attatched like Run Amok's wedge be a good beginer hackbot? A: Read thru the posts in this archive. Q: Can a hobby R/C racecar be used and hacked for a combat robot? A: It would depend on the car, but likely not. Hobby-grade R/C racecar drivetrains are geared for speed - combat robots need torque. I have seen toy-grade R/C cars successfully hacked for weight classes as high as 12 pounds. Q: Can I hack a "Battle Wheels" R/C toy for a ant or beetle? A: I haven't had the opportunity to tear one apart, but the drivetrain from the Johnny Lightning 'Battle Wheels' toy is likely a good candidate for an antweight hack. The toys are designed to shove each other around in 'combat'. Weight is just over 10 ounces. Remove the upper structure of the toy, improve the traction, and add a wedge. The radios are AM without failsafes, so no active weapons. Q: What do you think of the 'Battle Ratz' robot kits that are sold from Roaming Robots in the UK? Worth it to import? 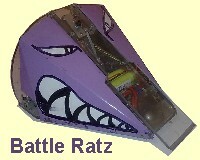 A: The Battle Ratz [discontinued] were developed as an arcade amusement. They were designed to operate for long periods with minimal maintenance, and the weapons were designed to be 'fun' rather than 'damaging'. These are very different design goals than those I would set for a combat robot. I don't believe that Battle Ratz would be effective in a tournament against 'real' combat robots. You could use the basic chassis and build something on top of it, but I think you could do better with a piece of plywood and off-the-shelf components available in the US. Q: Do you know where to find an R/C 'Dantomkia' toy on ebay? A: I'll assume your real question is, " I've been searching on EBay for an R/C 'Dantomkia' toy without luck. Any tips?" If you're outside the UK, try your search on www.ebay.co.uk and hope you can find a seller who will ship internationally. Be patient - everything shows up on EBay eventually. Q: Hi Aaron. I own a Biohazard hackbot toy and I wanted to ask, if I wanted to put newer, more powerful motors into the Biohazard toy, replacing the old toy ones, what motors would you recommend? Right now my robot weighs along with the motors, 2 pounds, 12 ounces. A: The design of the gearboxes is going to make replacing the drive motors with a something larger difficult. If you're after greater speed you might be better off overvolting. The motors will put up with a good bit of extra voltage - up to an 11.1 volt LiPoly pack would be worth trying. My hacked BB Pro toy 'Zpatula' runs the original motors at 7.2 volts, and I've found that to be plenty. Q: Hi. I'll be purchasing a custom series BattleBots toy, and I would like to know the approximate size after you hack it. Also, what would you suggest for the frame and armor? A: Where have you found a BB Toy to hack? They've become hard to find. The hacked chassis measures about 5.5" long by 4.5" wide by 2" tall and weighs just over 7 ounces without battery. The toy chassis is entirely acceptable to use -- no need to replace it. Plenty of armor material suggestions in the archive. Q: I bought the Battlebots toy on Ebay. It is 'Blendo' and the seller had another one, which I think is still avalible. I wanted to take the components out of the chassis and make my own so it would be more personalized. I am thinking about .25" thick lexan sidewalls and .023 or .041" thick carbon fiber plates for the bottom and top. Sort of modeling it off of 'Shazbot'. A: You're going to have trouble removing the 'components'. The large drivetrain gears are integeral to the chassis -- not nice one-piece gearmotors. I suppose you could just use the radio / motor controller system and patch in new gearmotors, but that'd be kind of a waste. I would suggest leaving the chassis largely intact. Q: Hey Aaron, whould it be a good idea to hack a Robot Wars RC toy for an ant or beetle? A: I've never opened up one of the R/C Robot Wars toys. They are a bit too large to make an ant, but might be OK for a beetle -- but their radios operate on 40 MHz: not a legal frequency in the U.S.
Q: I have a motor in a 1 pound Kato Kit that needs replacing. What motor do you recommend? A: As I recall, the Kato/Composite Labs kit used the 50:1 Copal gearmotor. Best to replace both of the motors while you are at it. Q: Hey Aaron, is a 'Diesector' R/C Battlebots Pro series able to work as a combat robot when modified? A: The chassis and drive train in the Pro Series BattleBots toy makea a good beetleweight platform. My beetleweight Zpatula is built around the Pro Series 'BioHazard' toy. Check elsewhere in this archive for details on conversion. Q: Would the weapon from the bot work? A: The 'weapon' on the Diesector toy is designed to be safe for kids, not effective in combat. Also, a robot with an active weapon will require you to replace the radio with a full failsafe FM or Spread Spectrum unit. If you scrap the active weapon many events will let you use the AM radio that comes with the toy. Q: Can you think of a design for it? A: Sorry, we don't offer a free 'design-your-whole-robot-for-you' service. Q: Can you think of a use for the jaws? A: They would make a very nice doorstop. A: I think you're going to have trouble with this even with the instructions, Anthony. The 'kit' is mostly a pile of carbon fiber rods, some glue, thread, and a couple of gearmotors. Not a project for an inexperienced builder! The instructions were more of a set of suggestions and tips than a complete guide. I found an archive copy on the old Team Think Tank website: VDD Instructions. Only a few of the photos are there, but the text may be some help. Q: Aaron, thank you so much for helping me get instructions!!!! On the original version of the VDD kit weapon, how did Team Think Tank get the 2.84 once carbide-tipped saw blade attached to the 1.5 mm shaft on the 280 motor? I don't see were they got that special hub or how they made it. I have the gearbox drive version of the weapon, but if the gearbox fails I might want to try direct drive to save money. The VDD instructions do appear to show a weapon motor direct driving the blade, but this is a really awful idea. 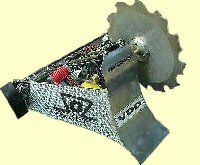 The original (pre-kit) VDD had an O-ring belt drive to the weapon, and all kit versions of VDD from at latest December 2003 onward had the gearbox drive. If your gearbox fails, buy a new one. Q: Where can I buy a 30 LB BattleKit? It seems that they are no longer sold. A: Looks like you've answered your own question. Try dropping an email to powermail@email.com -- they may have one left. Q: What do you think about the Robot Marketplace Basic Antweight Starter Package? A: I've commented on the Robot Marketplace packages [no longer available] before. Skim thru this archive and the archive to find those comments and comments on other kits. Briefly, the Basic Package is not a complete kit, it's just a bunch of components in a box. It has no chassis, armor, weapon, or instructions. The dual-motor gearbox is effective but bulky. The radio equipment is outdated and too expensive for the features it offers -- the Spektrum DX5e would be a better choice. If you're on a tight budget and want a complete kit, take a look at the Viper starter kit from FingerTech Robotics, next question down. Q: What's your say on the Viper starter kit by FingerTech? Worth it? Good for an ant with a servo lifter? The kit features a "6-Channel radio transmitter and receiver pair", but they don't say which radio it is. I don't know anyone who has used the FingerTech "tinyESC" motor controllers or gearmotors. The "sporty vacuum-formed lid" certainly does not qualify as 'armor'. There are reasons you don't see robots using 9-volt alkaline batteries for power in combat. The 9-volt battery is not designed for high amperage draw. They can only deliver about an amp each, with a significant voltage drop at that power level. FingerTech mentions that the chassis is aluminum, but they do not mention the alloy used or the thickness. I'd ask FingerTech a lot of questions before I bought, and I'd be ready for some extensive upgrades to get the little bugger 'combat ready'. Q: I'm not sure about some of the parts, but the motors in the kit are the discontinued 54:1 Banebots 16mm gearmotors, and the receiver appears to be the vertical pin variation of the GWS pico receiver. Also, I have used the TinyESCs in my ant wedge driving two 17:1 Maxons each and they work great. If the motors are the discontinued BaneBots 16mm spurgear units, you'd best buy some spares while you still can. The price of a pair of the 'TinyESC's (one with BEC, one without) is $58.65. For less money you can buy a Scorpion Mini RC Dual Motor Speed Controller with greater current capacity, a flip channel, mixing, and a proven track record. Guess which one I'd buy? The 'Tiny ESC' units are very basic, but are also very small (tiny) and very light (8 grams for the pair). I'm not sure how much that helps you with this kit that has plenty of space and weight allowance. The chassis is 5052 aluminum, 1/16" thick. 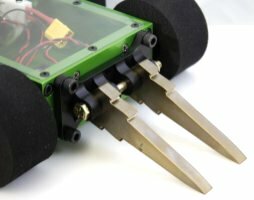 Offering an antweight combat robot kit for under $160 [now under $120 - January, 2012] does call for some compromises, and FingerTech has shaved every dollar to meet this low price point. Kurtis defends the use of the 9-volt alkaline batteries for power, citing that they have proven adequate in testing. I've run some calculations and found that a pair of fresh, high-quality 9-volt batteries can provide marginally enough amperage for the twin FF-050 motors and a lifter servo. Perhaps they are adequate for a low-budget starter package? I'm not a fan of 'going cheap' and buying robot parts you'll need to upgrade to move upward in robot combat, so I would have made some different component choices. I'd much rather spend a few extra dollars to upgrade the kit to a Scorpion ESC and a Spektrum DX5e radio that would be useful in the next robot you build and that would retain good value when you did sell them to upgrade further. Still, with this kit you'd be able to simply and quickly put together a robot platform that you can steer around under radio control. Add a simple wedge or servo lifter and you could get into competition for a rock-bottom price. Q: Would the components from the 'Advanced Antweight Starter Package' from Robot Marketplace be good for a beetleweight? A: I don't think the 'Advanced Antweight Starter Package' [no longer available] is good for an antweight, let alone a beetle. The radio is not current specification, the charger is really marginal, and the power supply is overkill. The actual robot components are not a kit but just a collection of pieces without a plan or instructions. The motors, hubs, speed controller, battery, and wheels are fine for an antweight but there is no chassis -- just a pile of assorted carbon fiber pieces. An experienced builder could turn this pile of pieces into a functional antweight, but unless you plan a beetle with a huge weapon that you just want to push slowly around the arena it just wouldn't work. Q: What is a good RC toy to hack for a Fairyweight combat robot? A: With only 150 grams of weight allowance, you don't have many choices. I've seen a few fairyweights made from the standard Micro R/C cars, like 'Mouseasaurus', but they are pretty weak. Pivot steering and gearing for speed over torque makes for a poor fairyweight. I haven't had a chance to play with one, but the Air Hogs Zero Gravity Micro looks like it could make an interesting combat robot. It has differential steering and a suction fan to stick it down to the arena surface. The problem is the infrared R/C controller: they don't work very well in sunlight or thru Lexan arena walls. Some event organizers may not allow their use. Check with the event you'll be entering: if they'll let it run I'd give it a try. Q: Would the GEARS-EDS heavy metal chassis be good as a 12 pound combat robot base? A: The Gearseds HMC has been used as combat chassis (photo), but there are a few things that need to be changed to make it competitive and reliable. The motors and gearing supplied will only give around 2.5 MPH, the adjustable motor slots will need to be better secured, the battery must be held in place more securely, and there is not much weight allowance left for armor or weaponry. For the $500 price of the Gearseds HMC, you can buy a BattleKits featherweight kit that is fully armored, fast, durable, and battle tested. I'd upgrade to the BattleKits featherweight. Q: Hello Aaron. I'm building an ant from old toy parts, but I have a problem. I can't afford an ESC or a decent radio, and the two R/C cars I have both use car steering. The gearboxs I'm using only has the wheels sticking out of the bottom so I need a servo to use for a weapon/SRiMech. Any suggestions? A: You've got several problems. For a start the AM toy radio you plan on using is not legal for an ant with an active weapon, even if that active weapon is only a lifter/SRiMech. Also the radio signal used by your toy radio is also not compatible with hobby-grade servos, so even if you used both of your radios for four channels of control you still couldn't get a servo to work. Converted toys can make effective ant or beetleweight combat robots, but I think you need to start with a different toy. Browse this archive for ideas. 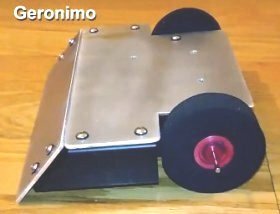 Q: I am 12 years old and am almost finished with building a modified BattleBots toy and I want to enter it into a competition. Are there any robots competitions in the Central Oregon area, and if so how can I sign up? A: Check the tips for finding robot combat events in the -- question #12. Your closest antweight competitions are in Seattle, sponsored by Western Allied Robotics. Registration info is on their website. Q: Another question: I want to build an antweight robot but I can't find anything that will stay in my budget of $60 dollars. Can you help me or do I have to save up my money? A: For your budget I'd suggest sticking with your BattleBots R/C toy and using the cash for armor and battery upgrades. A rechargeable LiPoly battery pack (7.4 volts) and an inexpensive lithium charger will improve performance, save weight, and can be used for future robot projects as well. 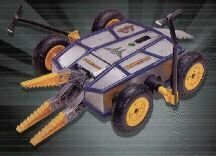 A lot of successful antweight robots were built from the BattleBots toys. Browse this archive for ideas and links to info on modifications. Q: Are there any pictures of the Composite Labs flipper? How does it work? I know that they are no longer available. A: I can't find a photo of the Composite Labs flipper weapon add-on. Their website has been down for a year and the Wayback Machine doesn't have an archived copy of their flipper page. I never saw one of their flipper weapons in person. I can't find any record of a Composite Labs flipper ever fighting at any event, and I'm not entirely sure they ever actually sold one of the weapon kits. I'm gonna call their flipper 'wishful thinking' until I can prove otherwise. Q: I have remote control car. I took of its wheels so now it has a gear hanging out the side were the wheel should be. I want to make a better wheel. What is a good way to make a wheel that will fit on to the gear? A: I'm not sure what you think would be 'better', but I'd start with the wheel you took off. It already has the correct fittings to match up to the axle/gear on the car. Building a new wheel from scratch that would fit and run true is not simple and requires tools you probably do not have. There are tips on improving tire traction in this archive and in the archive. Q: Could you use a robot from The Machine Lab as a sublight combat robot, like the MMP-5? A: The Machine Lab robots are not designed for combat. The chassis is thin aluminum, the wheels are unprotected, and they are slow (less than 3 MPH). Without radio the 4.5 pound MMP-5 lists at $545, the 8 pound MMP-8 is $795, and the 30 pound MMP-30 is $4045. You'd do much, much better with the BattleKits Featherweight. It is designed for combat, fully armored, and plenty quick. For $499 you get an armored chassis and drivetrain with two E-150 Magmotor motors. Add battery, ESC and radio and you have a competitive featherweight. A: Read this archive for lots of info on converting R/C toys to combat robots. A two pound robot would fight in the beetleweight class which has a maximum weight of three pounds. Full information on weight classes, radio requirements, and other design issues can be found in the current Robot Fighting League rules. Q: Would it be a good idea to join 2 Inertia Labs antweight chassis together and put a wedge on the front? The speed controller would control power to all 8 motors. A: No. First, it would have very poor maneuverability. As a bot's overall wheelbase increases compared to width, the bot becomes more stable in a straight line and more difficult to turn. You'd have a very long robot that would be easy pickings for a more maneuverable opponent. Second, pushing power is limited by the weight on the drive wheels. Power beyond what you need to spin the wheels will not significantly add to pushing power. Correctly geared, additional power can provide better acceleration and/or top speed -- but speed has very limited use in a tight insect-class arena and the 4-motor Inertia Labs chassis is plenty quick to start with. Q: Have there been any beetleweights made out of the 'Diesector' pro series RC toy? A: Not that I have seen. The pro series 'Biohazard' with 6-wheel drive and a lifter was more appealing for conversion. Q: Do you think the Inertia Labs kit is good? It seems like you don't like it that much. There is very little room in the enclosed radio/battery compartment. Any additional equipment has to be hung off the outside. The one-piece machined aluminum chassis is difficult to repair if it is badly damaged. The price for a complete kit is quite high and some of the components of the kit (charger, transmitter) would need to be upgraded to move to a higher weight class. If you have a specific plan for the chassis and are able to deal with the limitations, it could certainly be the core of a successful antweight. Q: Isn't the Inertia Labs chassis $45 cheaper at the Inertia Labs website than at the Robot Marketplace? A: The price for the bare chassis at Robot Marketplace is $25 -- same as from Inertia Labs. I don't think that Robot Marketplace has updated the prices for the individual components in their complete kit. Q: I have all the parts to build an Inertia Labs antweight flipper. Would it be a good first robot? A: I recommend that first-time builders keep their robots very simple. You'll have enough new things to worry about with battery maintenance, R/C system set-up, traction issues, ESC mixing, driving, radio interference, wireing, tournament procedures, and repair problems. You really don't need to add to that with pneumatic valving systems, pressure tanks, weapons channels, digital switches, complex attack maneuvers, and additional pit checklist items. I'd suggest that you build the basic Inertia Labs platform, bolt a sturdy wedge onto it, and go out and get some experience before tackling a pneumatic flipper. Q: Would it be a good idea to make a full body spinner using the Inertia Labs chassis as the platform? A: An effective FBS uses as much of the available weight allowance as possible for the weapon system. You would be wasting weight to use a four motor, bulletproof chassis as the basis for an FBS. Q: This is more of a comment than a question, but the Inertia Labs antweight kit can be bought for less than half the Robot Marketplace price directly from Inertia Labs. an Astroflight DC power supply. If you remind Jim that the chassis price has dropped, you can also take off an additional $44 from the RMP kit price. Jim provides a great service to the robot builder community and you can be sure that he won't hurt you on price. Q: How do you hack a Pro Series BattleBot Toy? Is it the same as the Custom Series? A: The Pro Series toys have a much different internal layout than the smaller Custom Series, but the hack is similar. You need to disable the 'battle damage' sensor and lock the slip clutch on the weapon gearbox. If you're going to use the active weapon in competition you'll need to replace the 3-channel AM radio and motor / weapon controllers -- an FM radio with drivetrain and weapon failsafe is the minimum required for an active weapon beetleweight. The rest of the chassis and drive train are useable as-is. The Pro Series use a 6 volt NiCad pack, but I run mine on 7.2 volts. Q: Where can you buy a Biohazard BattleBot toy now that they don't have any on EBay? A: You can be patient and hope one shows up on EBay. Q: I plan on building an Inertia Labs antweight. I've racked my brain trying to figure out how I could utilize a spinning disk weapon with this bot, without having motors and mounts, ect. sticking out left and right. Any suggestions? Would the Robot Market Place antweight be more compatible with a spinning disk weapon? I don't care if it's vertical or horizontal. A: Mark J. here: how about a kit that comes with a vertical spinning disk already? The Team Thinktank VDD kit is out of production, but you might be able to scrounge enough parts to put one together. Ask around on the Delphi robot forums. Big spinning disk weapons typically do kinda stick out all over. Based on the theory that "the best defense is a strong offense", most big spinners concentrate all available weight into the weapon system itself rather than into armor or a 4-motor drive system like the Inertia Labs design. From that perspective, the 'Robot Marketplace Advanced Antweight Starter Package' [no longer available] better fits the bill. As I have pointed out here before, the Robot Marketplace packages are not as much 'kits' as just a box full of parts. If this is your first combat robot, you're gonna be looking at that box of parts and doing a lot of head scratching. Q: How could I make a small drum for an antweight? I'm using a toy monster truck and hacking it, so I have little money, maybe $40. A: The 'RFL rules' say that if you run an 'active weapon' (drum, spinner, flipper, etc.) on an antweight you must run a hobby-grade FM radio and provide an electronic failsafe on the weapon channel to shut the weapon down if the radio fails. That pretty much squashes low-budget toy hacks with active weapons. Stick with a passive wedge or brick design for your toy hack and you'll be legal with the AM radio that came with the toy. Q: I'm building a "brick on wheels" to prove to my dad and uncle that I can build a robot. I need some inexpensive parts. Do you have any tips? I have no intentions for competing and I already have three 24 volt scooter motors. Thanks! A: Mark J. here: welcome to 'Ask Aaron: questions and answers about bricks on wheels'. speed and pushing power are not important. Grab a 'Fly Wheels' R/C toy. My local toy store is closing them out for $10. We'll use the R/C electronics from the toy for your brick. Get rid of those scooter motors. We'd need to build a drive train for them that would be both expensive and difficult. Google 'surplus gearmotor' and look for DC units that spin at some reasonable speed. Drive motors from a child's riding toy would be perfect. Get two for about $15 each. While you're shopping surplus, find some double-pole power relays rated about 5 amps with a 5 or 6 volt coil. Get four at about $4 each. We'll use the low power R/C motor controller output to control the relays, and the relays will control the higher-power gearmotors forward / off / reverse. Run down to your local Radio Shack and get four 1 amp diodes: about $2 total. The diodes will direct the forward or reverse output from the R/C motor controller to the correct relay. Open up the Fly Wheels toy. Remove the power wires from the motor on each side. Patch the power wires into the relay coil connections of the two amplifiers as shown. Note the position and orientation of the diodes. When the amplifiers are installed on both sides load some batteries into the toy transmitter and receiver. Push the right control stick forward. One (and only one) relay on the right side of the robot should click closed. Pull the stick back and the first relay should pop back open and the other relay should click closed. Return the stick to center and all relays should be popped open. Repeat with the left control stick. If everything is good, hook up the amplifiers to your gearmotors and the main battery. We don't run fuses in combat robots, but a suitably sized inline fuse between each amplifier and the battery would be an excellent idea in your brick. Prop the drive wheels up off the ground and push the transmitter sticks forward. If both wheels spin 'forward', great! If both wheels spin 'backward', reverse the power terminals on both motors. If one wheel spins 'forward' and one wheel spins 'backward', reverse the power terminals on the backward spinning motor. I'll leave it to you to find suitable wheels, battery, charger, and hardware. You could do worse than to start with a whole kiddy riding toy and just concentrate on adding the radio and motor controllers. Best luck! Q: I sent the brick on wheels question, you were a great help -- thanks. I live in San Diego and the nearest robot events are several hundred miles away in San Francisco, so I might want to start my own event. I'm 12 years old and might be able to get help from my dad, uncle and friends. A: Yes, robot combat events are a little scarce right now. 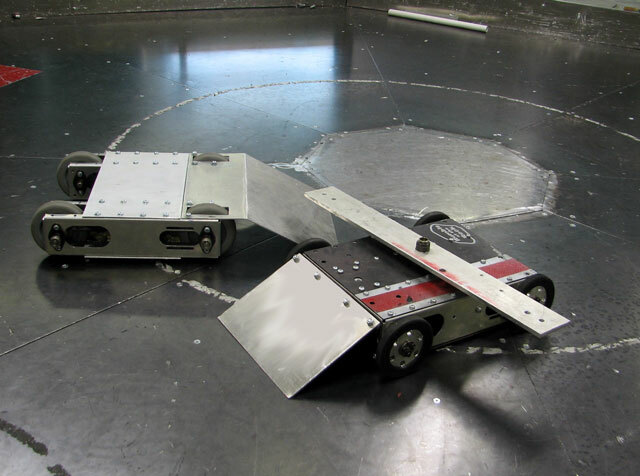 There should be greater interest following the return of BattleBots to TV toward the end of this year (2008). Search the archives for tips on hosting your own event. 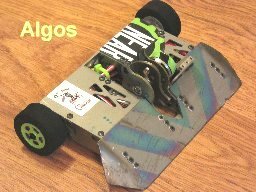 Q: Could I take the electronics and motors from an 'Arrow Ace Airhog' airplane, mount them on a lightweight frame, and belt drive the wheels to make a competitive antweight wedge? Should I replace the motors? It seems that the battery/charger, speed controller, and radio would be OK if the bot didn't have an active weapon. Airplanes don't back up, so the speed controller doesn't have a reverse. How are you gonna back the 'bot out of a corner? The speed controller will quickly fry if the motor is bogged down pushing. Spinning a propeller in the air uses a lot fewer amps than pushing an opponent across an arena. The battery is too small. Flying uses much less power than robot combat. The motors will need about 30:1 gear reduction with even small wheels. You can't get that much reduction from a single-stage belt drive. Start with some other R/C toy. A: You can build a competitive antweight for very little money, but adding a spinning drum weapon creates problems. If the competition uses the standard RFL rules, an antweight with an active weapon requires a minimum FM radio system with an electronic failsafe on the weapon channel. Such a radio system, even purchased used, will eat up your whole budget. An antweight without an active weapon can run an inexpensive toy AM radio system. 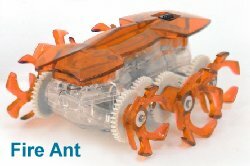 Many competitive antweights have been based on R/C toys. Read thru this archive for tips on this inexpensive approach. Q: OK, I have a Vex transmitter that runs on legal ground frequencies, but the receiver uses a phone jack and not wires. It has replaceable crystals. Now would it be posible - minus the drum? A: Your Vex transmitter is a good start, but the Vex receiver is not compatible with combat robot components like speed controllers -- there is more difference than the connectors. Search for 'Vex' in the archive for more details. That leaves you needing a small FM receiver, twin drive trains, a two-channel speed controller, wheels / tires, a battery / charger, a chassis, and armor. That all adds up to about $100 and you still need a battery, chassis, and armor. I'm still leaning toward a converted toy if you want to be competitive for under $100. Q: Pyrobug again: would it be a good idea to build an antweight without a speed controller? A: If it was a good idea, lots of builders would be doing it. You're not going to save any money by doing that -- you'd still need a pair of reversible switch interfaces to control the motors, and they will cost at least as much as an ESC. If you convert a toy it will most likely have a combined receiver/controller with forward-off-backward control for each motor. That will take some practice to get used to, but many antweight tournaments have been won by converted toys without proportional motor control. Q: At my school we built a robot from a kit that had two motors that we attached to kind of a power box with clips and wires. The box worked as a receiver, a speed controller and a battery. Do you know what kit this was? If so, where can I get one? A: It was probably the 'Mega Bloks Battle Bloks' set. Team JuggerBot used them for a 'build your own robot' workshop at a technology festival a few years ago to let people build custom R/C combat robots in just a few minutes. They were way cool, but I haven't seen them for sale anywhere in several years. There are other kits kinda like that. The Vex Robotics kit includes modules that plug together to quickly make an R/C or microprocessor controlled robot. There are also several versions of the Lego Mindstorms kits with similar snap-together modules. Both of these kits have been widely used in schools. The VEX and current Lego Mindstorms NXT kits are available thru retail outlets like amazon.com. Older versions of the Mindstorms kits can be found on EBay. Q: Can you tell me how to reduce the speed and increase the torque on my Fly Wheels? A: A Fly Wheels R/C toy would make a good start on an antweight if you did cut speed and increase torque. Smaller wheels and/or more gear reduction will do the trick, but neither is easy to do. I'd suggest taking the toy apart and using the electronics and drivetrain on a new chassis that could accomodate small diameter wheels. Q: Do you think that the 'Complete Micro Drive Kit' from Robot Marketplace [now discontinued] would be a good starter ant platform for a first time bot builder? A: Mark J. here: It's not even close to being a 'complete kit'. You get a chassis, motors, wire, and wheels. You need to come up with radio gear, an ESC, a battery pack, charger, and some sort of weapon. The machined aluminum chassis is way cool, but not easy to repair if it gets pranged. You might want to order a spare for your pit box. I don't really consider this to be a 'first time' kit. Q: Were can I get the 'A:1 Complete Antweight Kit' now that Composite Labs shut down? A: Weak! I hadn't heard that Composite Labs was gone. I had been recommending their kits. They were the manufacturer and only source, so they're gone for good. It's difficult for me to recommend any of the currently produced antweight kits for a beginner. You're going to spend $300 or $400 and end up with a marginal radio, a low-end battery charger, and a pile of parts with no specific instructions. 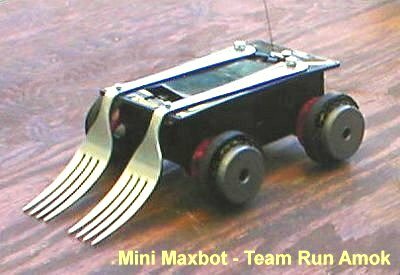 I'm gonna go back to suggesting that a beginner find an old BattleBots R/C toy on EBay, hack the radio and drive motors, add a wedge, and go beat up some $400 'bots for $50. Q: I'm turning a toy car into a robot. I took it apart and put the gearbox back together so every thing runs smoothly. I need to know how to use a servo to steer the car because it only has one motor. A: Standard hobby servos will not work with your inexpensive toy radio system. You'll need to salvage the steering mechanism from the original toy car. Q: I'm thinking of using a 'Fly Wheels' toy to make an antweight spinner. If I made a T-shaped spike on the back of toy I think I could make it spin fast enough to do some damage. Good idea, or should it just have a wedge? A: Why not? It sounds like it could be fun to drive. Technically, it would be a 'thwackbot' rather than a spinner -- but that's good since thwacks can get by in most tournaments with the toy AM radio that comes with the Fly Wheels. Thwackbots suffer a little from the commonly used 'damage/aggression' scoring system because sitting in one spot and spinning doesn't get you any aggression points, but I still think it would be fun. Q: Any suggestions on cheap R/C cars that I could turn into an antweight? I've got about $40 to spend. If it's possible, I'd also like to have an active spinning weapon. I don't really need it to be legal because I just want it to play around with in my garage. I know that you've said "cheap and combat robots don't go together" and I agree, but I don't have much to spend and I'm not going to be competing. Find one of the BattleBots R/C toys (there is one as I write this for $25). There were a whole lot of very competitive antweights built from these toys - radio and all. You can find instructions on how to hack one for competition use in this section of the archive. Q: OK, I bought an R/C car and I'm now in the process of designing the armor and weapons. I was wondering how I could make the tires get more traction. Also, I need a light armor that won't break my budget -- I've got $20. A: Spend some time browsing our archive. You'll find posts on improving tire traction, and our Armor Guide. Armor selection depends not only on your budget, but on your experience in working with various materials and the availability of specialized tools. You might be interested in another post in the materials archive on Garolite. Just for playing around, plastic kitchen containers can be cut up to make pretty tough and resilient 'armor'. Q: Do you think that rubber cement will give R/C car tires better traction? It's all I have. A: I'm guessing that your R/C car has the common flexible vinyl tires. No, I don't think that rubber cement would help for long -- when it dries out it becomes hard and stiff. A tube of silicone sealant costs about $3 and would help traction a whole lot. 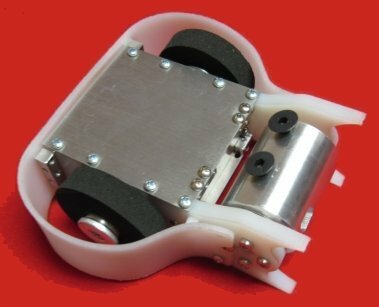 Q: I've found antweight robot kits on the internet from several sources. Will any of these kits produce a competitive robot? Would you recommend the 'Advanced antweight kit' [no longer available] from Robot Marketplace for a first-time builder? A: Mark J. here: most of the antweight 'kits' on the market are simply a collection of individual components stuffed into a box. Most require additional materials and lack specific instructions on the design and construction of the armor and chassis. This can be difficult and frustrating for a novice robot enthusiast as the competitive quality of the resulting robot is dependant on getting these design factors right. I think the best choice for a first-time builder would be the A:1 Ultimate Complete Kit from Composite Labs. The kit is well designed, entirely complete, ready to assemble, and comes with an instructional DVD covering the building process. Add-on kits for lifter and drum weapons are available to upgrade the basic wedge kit if you want to try an active weapon later on. Composite Labs also supplies on-site support for their kits at major events. The price is comparable to the Robot Marketplace advanced kit. Update: Composite Labs is no longer in business. The A:1 kit is no longer available. Q: I've noticed a lot of questions about the 'Fly Wheels' R/C toys. I bought one on clearance for $11. They are fast, but lack torque. I cracked it open to see what was inside: dual 130 motors and a drivetrain with some metal gears. I'm going to use the electronics with a Tamiya gearbox for a tracked antweight. Any reason not to? A: Thanks for the info! Some combat events do not allow toy R/C systems -- even on an antweight. The 2007 RFL rules allow robots 12 pounds and less with passive weapons to use AM / toy radios at the discretion of the event organizer. However, the rules also require a 'bot to have at least two radio frequencies available on which to operate -- not really possible with most toy systems. Check with the events you plan to enter to make sure your 'bot will be allowed to compete. Q: I have a toy robot with two drive motors and tank steering. The right motor won't run forward, only backward. Is it the circuit board or the motor causing the problem? A: The first thing I'd check would be the transmitter. Toy transmitters often use cheap contact switches on the control sticks that can get dirty or misaligned and result in no signal. Check and clean the transmitter switch for forward motion on the right side before you start looking for problems with the main controller board. I don't think the motor is the problem. When a motor fails it will almost always be inoperable in both directions. You can check this by removing the motor leads and connecting them directly to a battery to check for rotation in both directions. Q: Would a 'Shell Shocker' toy make a good bot? A: I don't think so -- too fragile, wrong gearing, poor traction, and no good weapon mounts. Q: Where can I get a full antweight robot kit including anything I would need to fight? A: Take a look at the A:1 Ultimate Complete Kit from Composite Labs. Q: Can I attach a rat trap to a Fly Wheels R/C? Have you bought a Fly Wheels yet? A: Rat traps really don't make good combat robot weapons. They are dangerous to handle, may not be legal for your local event, and are probably too heavy to add to a 'Fly Wheels' and stay under weight. A good wedge would be a better choice. I don't have a 'Fly Wheels' yet. Has anybody weighed one? Q: I have a micro R/C car. Is it a good idea to just put titanium armor on the r/c car for a fairyweight 'bot? A: Putting armor on a micro R/C car is only a good idea if you're trying to be underpowered target practice for the other fairyweight 'bots. Have you considered building an antweight? It's cheaper and you'll find more tournaments to enter. Q: What combat robot events allow R/C toys to compete? A: The 'toy' radio system is the problem. The Robot Fighting League ruleset allows 'toy' radio systems to compete in all weight classes up to 12 pounds (hobbyweight) if the 'bot has no active weapon. Check the RFL rule set for other restrictions. The local event organizer can overrule this, so check with them, too. Q: I've got about $50 to spend on a combat robot. What would you recommend? I got a 'Fly Wheels' toy for Christmas. A: For $50, the Fly Wheels is a good start. The rest is up to your imagination and how good you are at making things. I think I'd start with a sturdy front wedge. Q: Can I change the frequency (MHz) on a toy RC car? A: The short answer is 'no'. R/C toys don't have interchangeable frequency crystals like hobby R/C components, and changing from 27 MHz to 49 MHz is completely out of the question -- it would require extensive modification and tuning reserved for electronic tech specialists. Q: How can you tell what model motor is in your remote control car? A: You can compare the motor with photos and dimensions at robotmarketplace.com. A: So many Fly Wheels questions -- I'm gonna have to get one just to keep up! Robot builders love to overvolt motors to get more power! The trick is to stop before you smoke something. The Fly Wheels toys have some version of the 130 size motor. That motor in the BattleBots toys could take a lot of voltage -- for short periods. How much voltage the rest of the toy will take is another question. I'm guessing 9 volts would be do-able, but more power always comes with reduced lifespan. Q: How do I keep the wheels on the 'Fly Wheels' toy attached, but still removable for replacement? A: I don't have a 'Fly Wheels' here to look at. I suspect you can drill a small hole thru the center of the wheel into the hub and insert a small self-tapping screw and washer. Anybody have one handy to look at and tell me if this will work? Q: How do I attach a wedge to the 'Fly Wheels' toy without damaging the components inside? The only thing I can think to use is tape or hot glue. A: Neither tape nor glue will work. Q: Where can I find a [insert discontinued BattleBots toy name here]? Q: How can I extend the range of a toy radio controller? Can I just extend the antenna length or add stronger batteries? A: Technical question - Mark J. here: Don't increase your radio voltage! Batteries aren't your problem, as long as they're fresh. Range problems are often a result of too short a receiver antenna, or not having the antenna wire stretched straight. Different radio frequencies have different optimum antenna lengths for both the transmitter and receiver. Try a nice straight receiver antenna first, then try doubling it's length. Q: Can you build a hobbyweight combat robot out of a BattleBots Pro-series toy? A: The BattleBots pro-series toys weigh about two pounds stripped down and make a pretty good platform for a beetleweight. I'd stop there. The tiny 130-size motors are awfully small to be pushing 12 pounds of robot around a combat arena, and toy radio systems are not allowed in hobbyweight 'bots with an active weapon. By the time you replace all that, you might just as well have started from scratch. Q: How do I learn to hack toy controllers for combat robot use? A: There isn't much to learn, and there isn't much to hack. Trace the wires -- you'll have two power leads (+ and -), an antenna wire, and a pair of leads to each motor. Toy receiver/controllers don't come with specifications, so you'll have to guess how much power they'll handle. It's probably not smart to use motors much more powerful than the ones that came with the toy. Also, check with the organizer of the event you plan to enter. Some don't allow toy radio systems, and others place restrictions on their use. Q: Dear Aaron How do you hack the gear boxes out of battle bot custom series toys? A: There was a really good description of how to hack the BattleBot R/C toy at the Robot Dojo site, but the site was taken down. 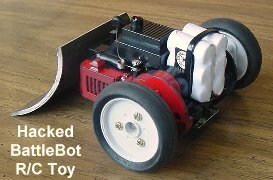 I've restored a complete version from archives available from the Wayback Machine: How to Hack a BattleBots Toy [restored]. Q: How can I modify a toy R/C car servo steering motor to drive a tank steer 'bot? A: Mark J. here: Inexpensive toy R/C cars do not have standard servos. Most just slide a magnet back and forth with wire coils -- no rotary steering servo motor to modify. There is a good article on modifying hobby grade servos for robotics use at the Seattle Robotics Society website. Q: What are some good toy hacks for beetle weight robots? A: The only toys I've seen hacked for beetleweight competition are the larger BattleBots Pro Series R/C toys -- Diesector and Biohazard. Like the smaller custom series toys, they are no longer available in stores. Your best bet on finding one is at EBay. Q: Where do I go to get a fighting robot kit? A: Technical question - Mark J. here: Most people build their combat robots from scratch. Combat kits come and go -- check the more recent posts in this archive for sources that may be currently available. Q: Hi, Aaron -- I don't have much money, but I'd like to get started in combat robots. What can I do? A: You can learn a lot and have some fun by converting an R/C toy into an antweight combat robot. Lots of small 'bots have been based on the BattleBots R/C toy. Those toys are now hard to find, but if you can find one [try EBay] there is a nice description of how to convert it into a combat robot here: How to Convert a BattleBots Toy [restored archive]. I've seen a new toy called Fly Wheels that sells for less than $20 and looks like it would make a good starting platform for a combat robot. Look around your local toy shop for something that turns by changing the speed of one side versus the other [tank steering]. You might find something no one else has used! A: It's a little like making a statue of an elephant: you start with a big chunk of rock and carve away everything that doesn't look like an elephant. Seriously -- there are all types of R/C toys. Some have steerable front wheels and some steer by making the wheels on one side turn the opposite direction from the other side. That later type is more maneuverable and might make a better robot, but either type will work. Just start taking off things that don't look like they belong on a robot -- the body, bumpers, wings, roll bars, whatever. Get it stripped down. The next step is to weigh the stripped-down toy to see how much armor and weapon weight you can add without going over the maximum weight for the class of robot you want. Toys make good 1-pound and 3-pound weight class robots, and larger ones can fight in the 12-pound class. Bolt on your armor to protect the wheels and other delicate stuff. Tough plastic is good, or fairly thin metal. Bolt on a wedge or a couple of spikes and you're a roboteer! You'll learn a lot from the things that go wrong with your first 'bot, and you'll have fun. Be careful with anything sharp, and don't attack your cat/dog/hamster! The picture at the right is my beetleweight 'Zpatula', a converted BattleBots toy. It works great! Q: Which BattleBot toy is the best for making a combat robot? I think it is Dr. Inferno. P.S. - Can I see a photo of 'The Gap'? All the BattleBots custom series toys have the same chassis -- but Dr. Inferno Jr. has the largest wheels. That gives it the most speed. You can always replace the wheels for any diameter you want, but DIJ is still a good choice. If you want a tank-tread 'bot, DoAll and El Diablo have treads instead of wheels. Q: Dear Aaron, can I use a toy car steering controller for a tank steering antweight? A: Tank steering takes two motor control channels - one for the motor(s) on each side of the `bot. 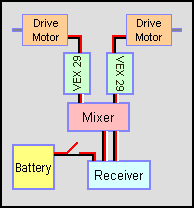 A toy R/C car has a one motor control channel and a second channel that operates only the steering servo. Find something that already has tank steering, like the `Fly Wheels' R/C toy. Q: Dear Aaron -- What are some good hacks for flea weights? A: Sorry, but I just can't get excited about a combat robot that you could put two stamps on and mail to a competition. Fifty grams is less than two ounces. It would take nine of them to make one US antweight! Check out the Antweight Forum at Delphi for good tips on antweights, fairyweights, and fleaweights. Copyright 2006, 2007, 2008, 2009, 2010 by Mark Joerger -- all rights reserved.